I have just returned from a trip to Dubai with my father, for which we chose the Shangri-La as our ‘home’ base to complete a heavily packed itinerary across this beautiful city. The Shangri-La hotel chain offers luxury hotels all over the world and they are known for their superior quality and service. 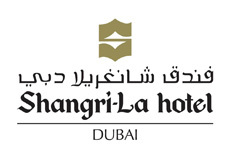 The location of the Shangri-La is very convenient and close to the main attractions of Dubai. You can just walk from the hotel to so many key locations in the city. These include the Dubai Maill, the fountains (a must-see! 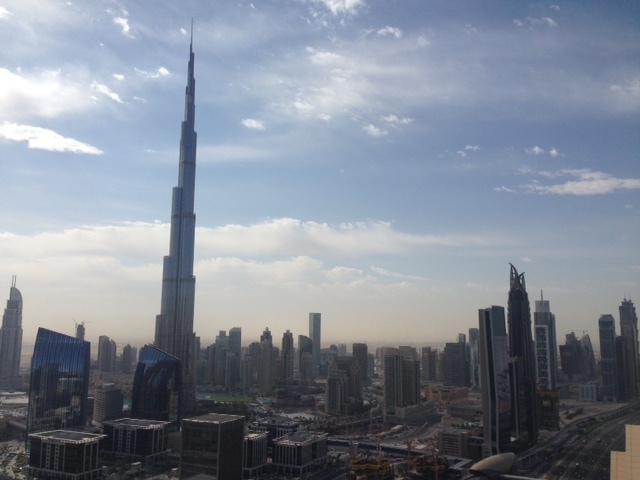 ), Burj Khalifa, and many more. If you are not into walking (or if the weather is too hot) the Dubai Metro is only a few steps away. Where should I start? 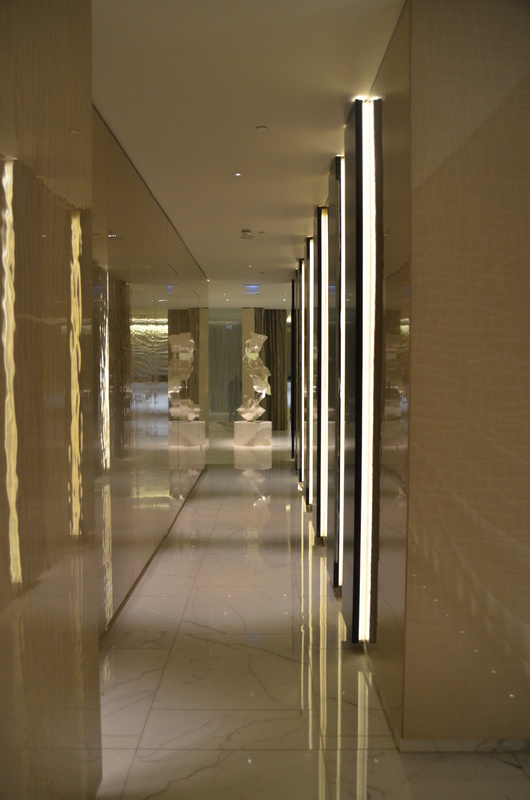 As soon as you enter the Shangri-La Dubai, you will notice the sense of luxury and details. The reception area is large and we were welcomed with a big smile! We stayed in a Horizon Deluxe room which gave us access to the Horizon Club. Oh, and I do recommend the upgrade to those rooms. 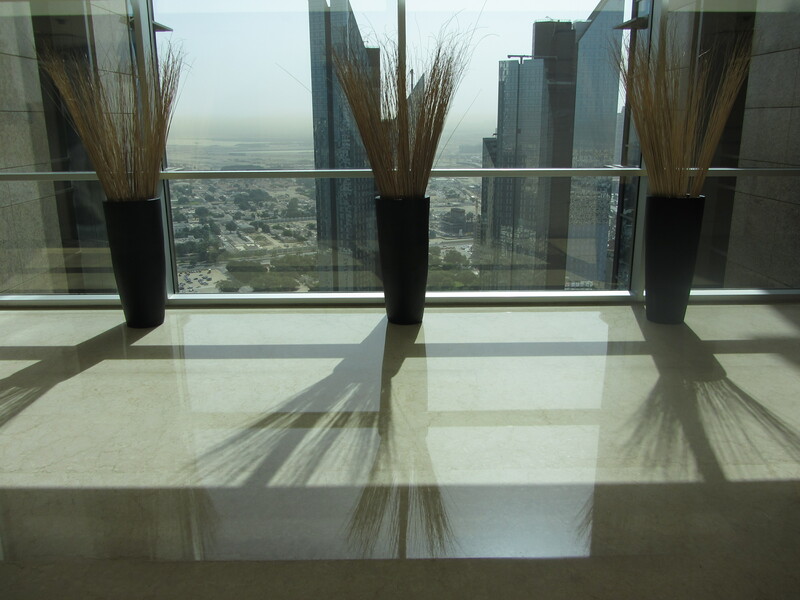 They are all located on the top floors of the hotel offering breathtaking views of the surrounding areas. Guests staying there, are offered a private check-in. Very convenient! The people of the Shangri-La will ensure that everything is taken care of. From the welcoming and efficient arrival process where the staff remembered our names, I knew that our 2 night stay at the Shangri-La Dubai would be flawless. The most friendly lady showed us around the hotel and showed us our room. A big comfortable room and plenty of space to fully unpack and get the baggage out of the way gave a real sense of being at home in Dubai. I loved the decoration and attention for detail, from the little bedside clock to the fresh flowers. 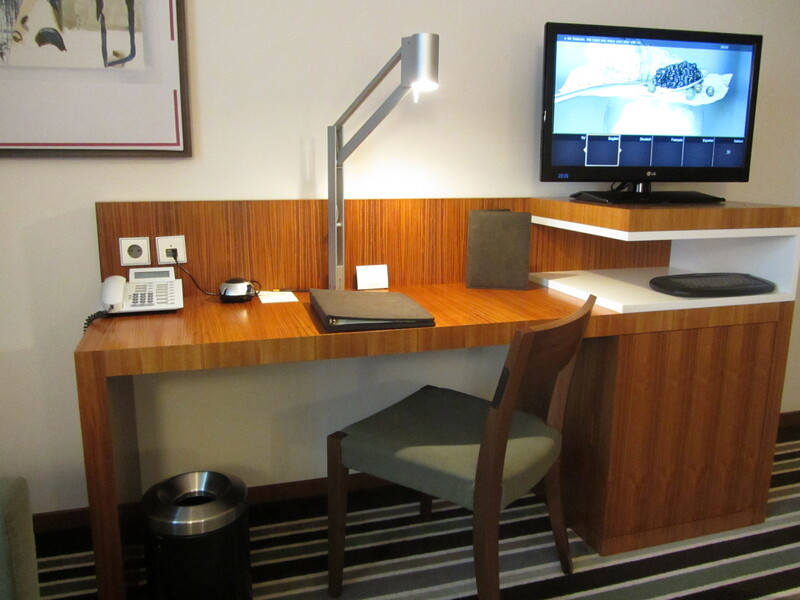 One thing I never had in a hotel: a desk equipped with scissors, stapler, etc. Very nice! 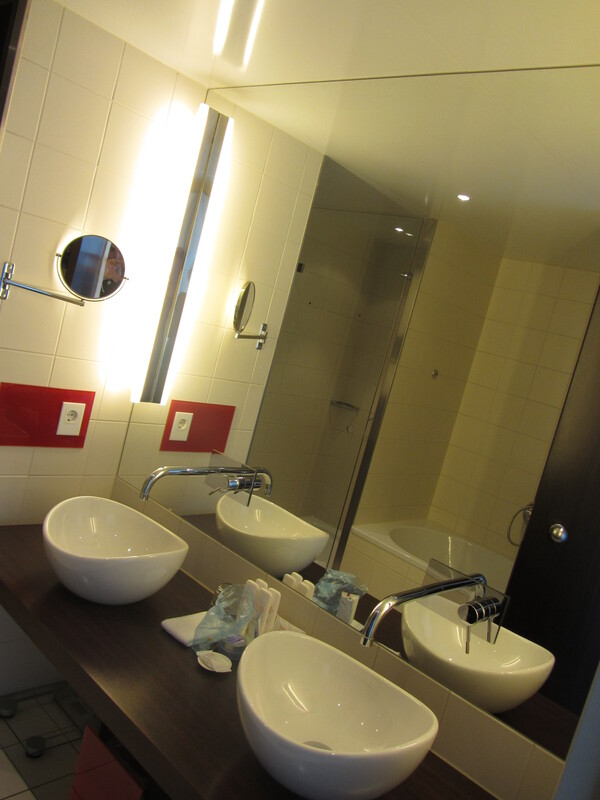 The bathroom was very large offering a separate bathtub, large rain shower and separate toilet and bidet. 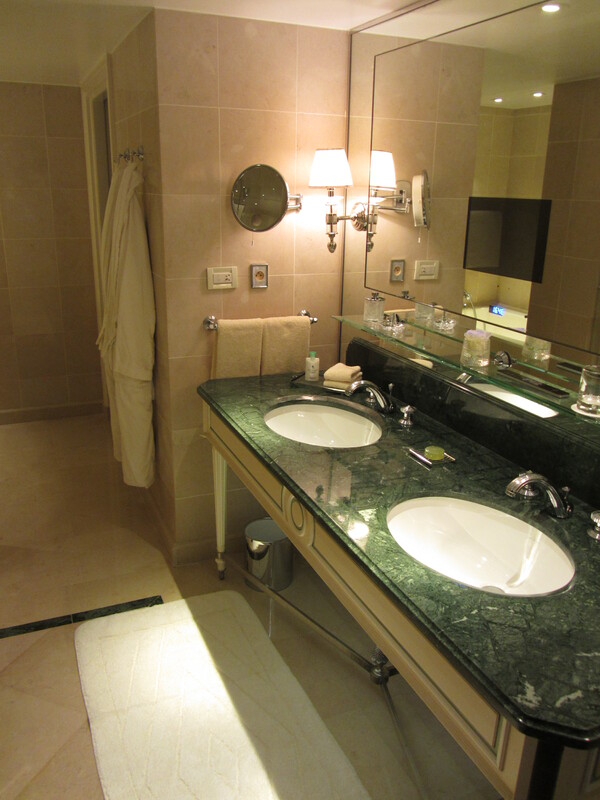 Everything in the room was immaculately clean and of a true 5 star quality. 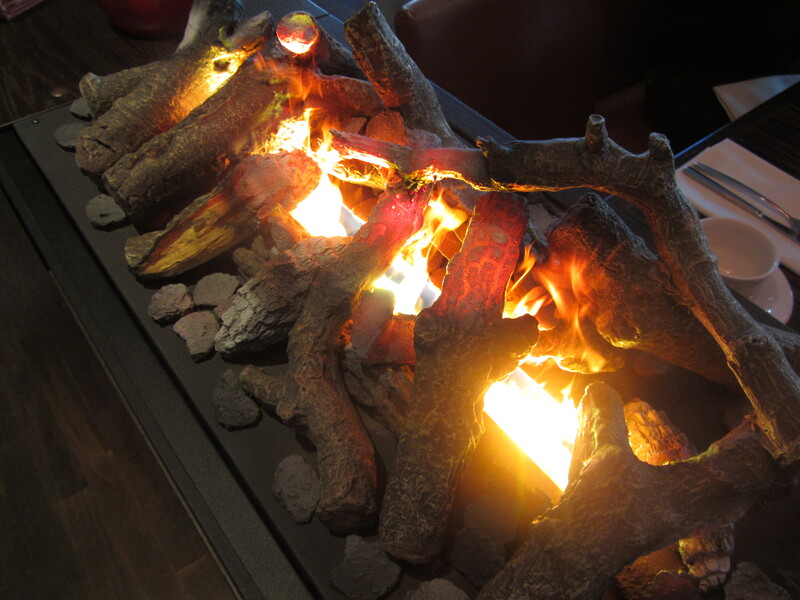 The staff nearly indulged us throughout the stay, which I appreciated and am thankful for. They will do anything to make your stay at the hotel unforgettable. Another big advantage of the Horizon club is the private lounge with free drinks throughout the day. 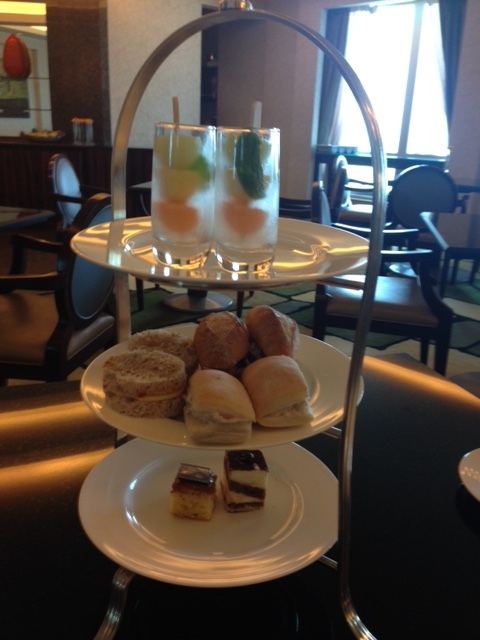 Afternoon tea is offered in the afternoon and from 5:30 – 7:30 pm. 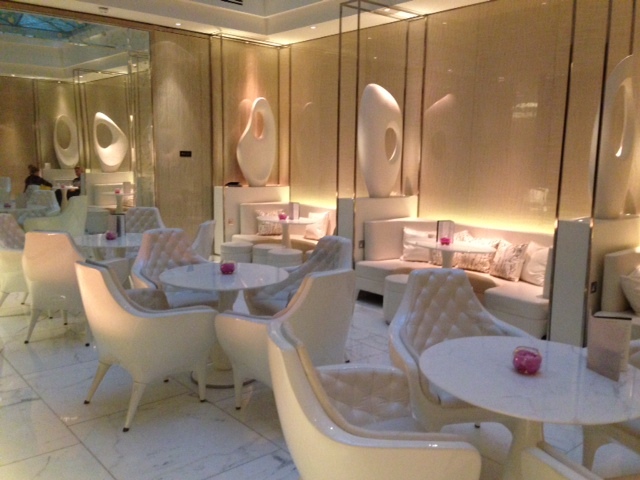 evening cocktails, spirits, canapés and light snacks are available at no additional charge. The food and drinks were of a very good quality! For a quiet breakfast, the buffet at the Horizon Club definitely is the best choice however the breakfast buffet downstairs (where all the guests have breakfast) is larger and offers more variety. It truly is an excellent breakfast, the food was delicious! A stay at the Shangri-La Dubai must include a dinner at Shang Palace with an extensive a la carte listing of several dishes. 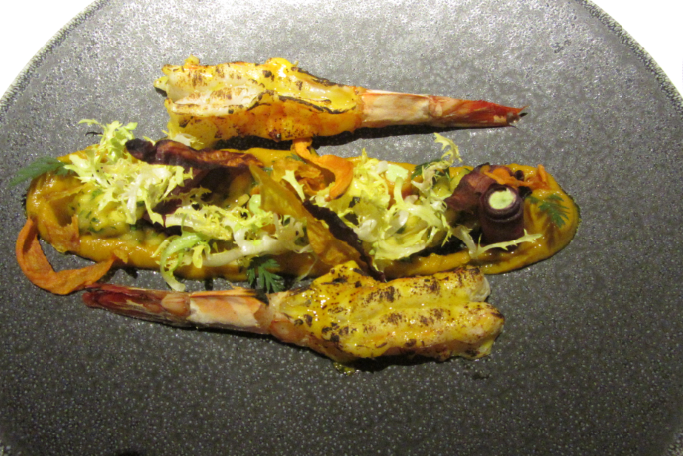 We had a 7 course dinner and loved every single dish. 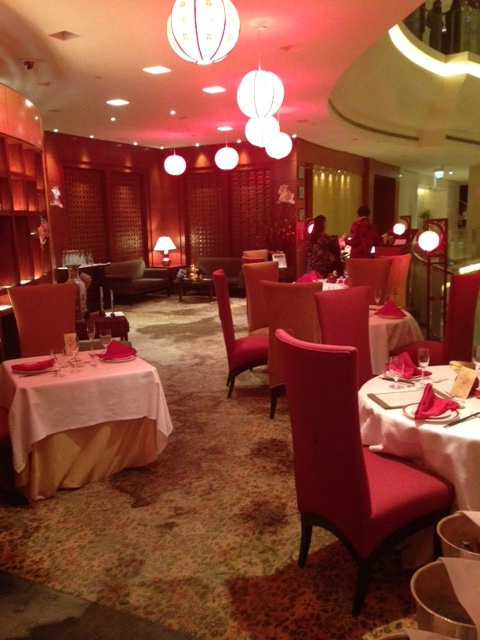 Such a great restaurant and probably one of the better Chinese restaurants in Dubai. 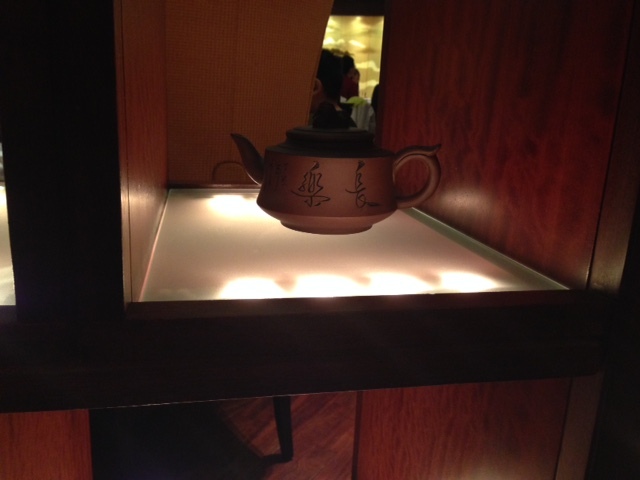 A real highlight and something that I look forward to every time I stay at a Shangri-La hotel. The spa area offers several treatment rooms, a relaxation area, a whirlpool and dipping pool, herbal steam showers and a sauna. The fitness area is well equipped and pretty large. 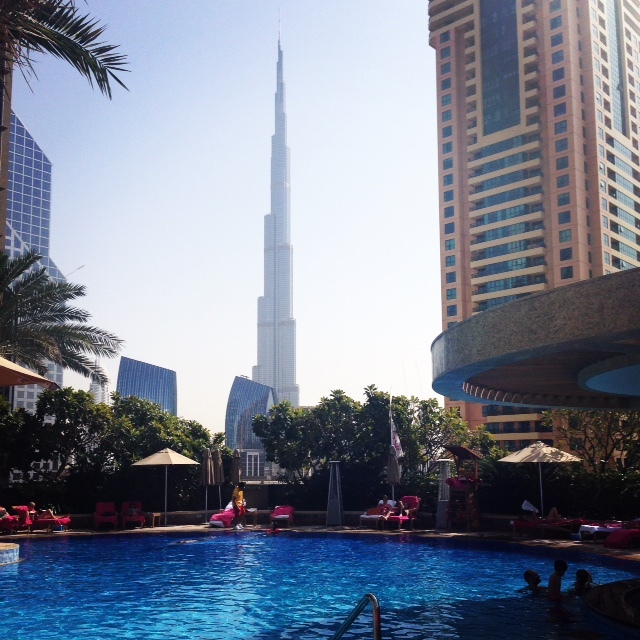 I loved the outside pool with a great view of Burj Khalifa! There was a “cool vibe” around the pool with excellent staff. 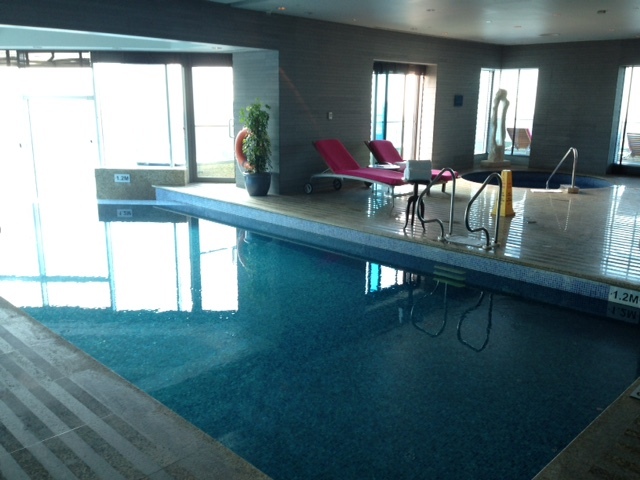 Guests staying at the Horizon Club have access to a private spa area with indoor pool and a small fitness area. 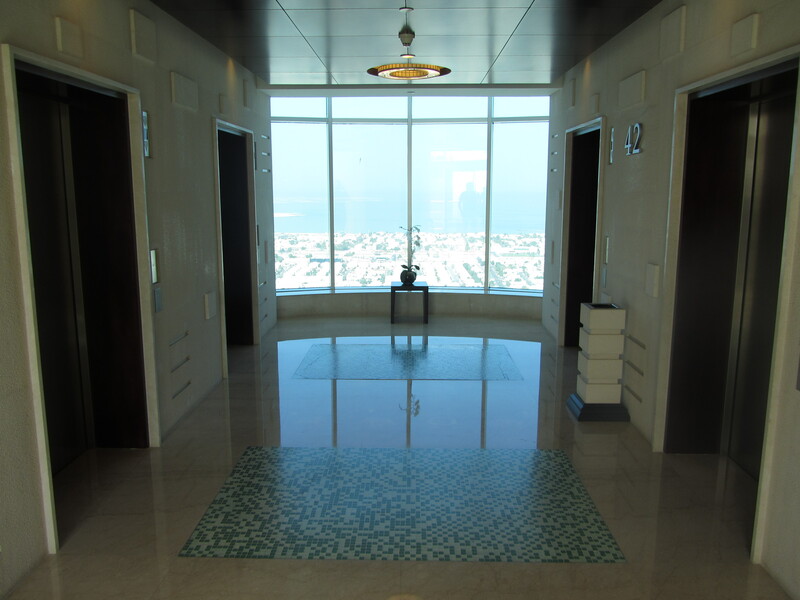 This private spa area is located on the top floor of the hotel offering the most spectacular view of Dubai I have ever seen! 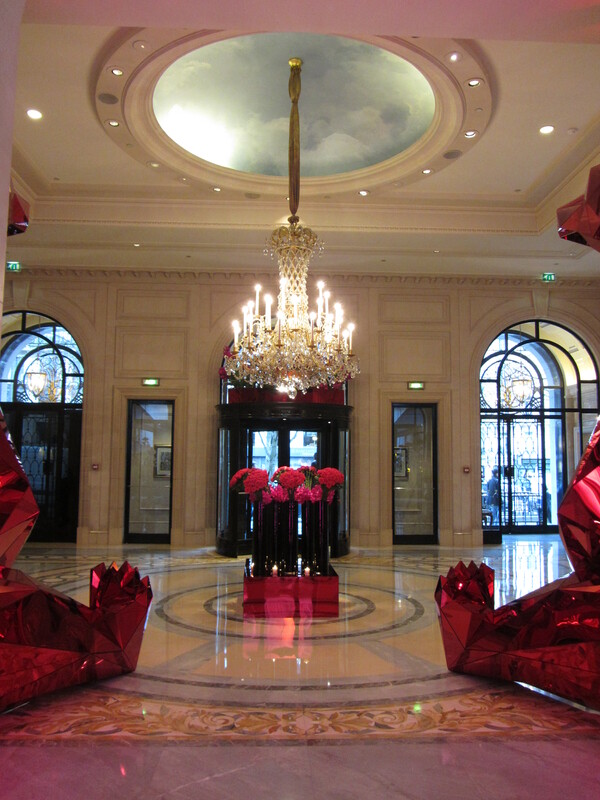 The world famous Four Seasons George V is one of the best 5 star hotels in Paris! 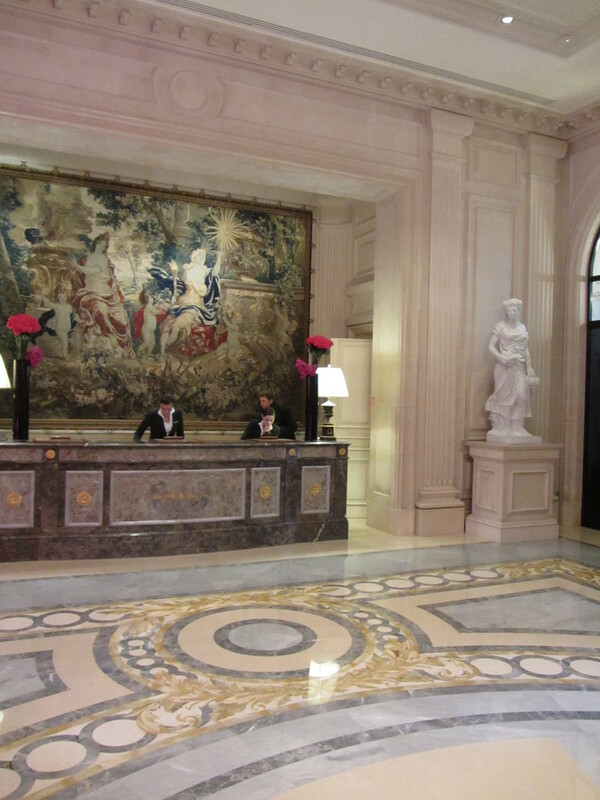 The location of this 5 star grand hotel is great because it is close to all the main attractions Paris has to offer! The Champs-Elysées and Arc de Triomphe are just a few steps away. Upon arrival, the service was outstanding. 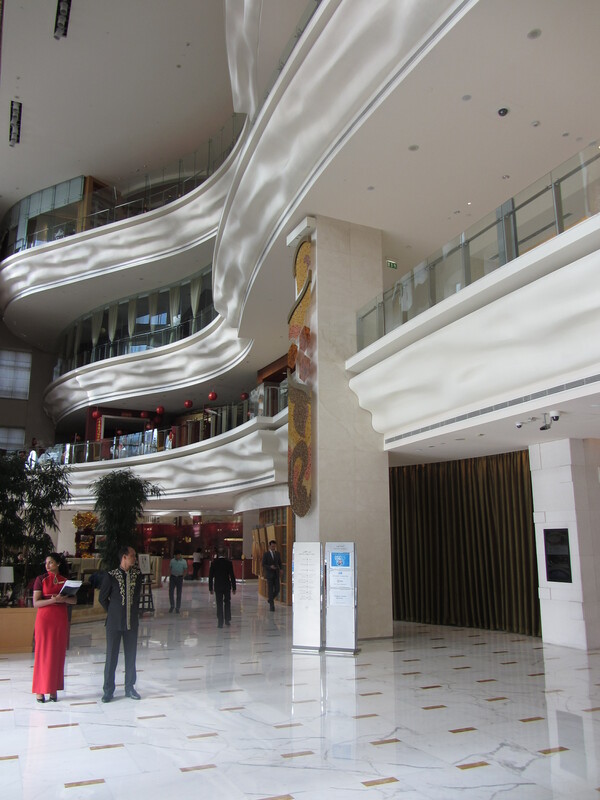 They guided us througout the hotel and showed us the beautiful lobby area and restaurants. 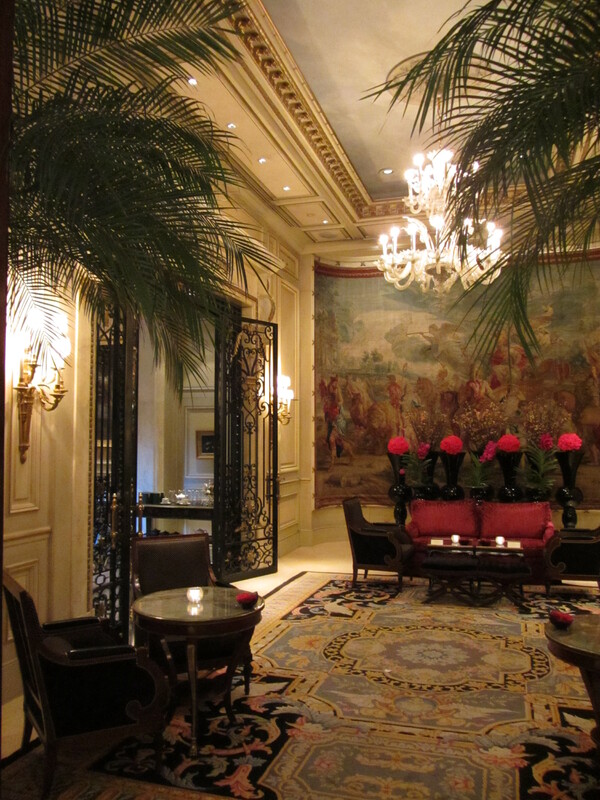 The lobby truly is beautiful and although this hotel is pretty popular and famous, it never seemed crowded. 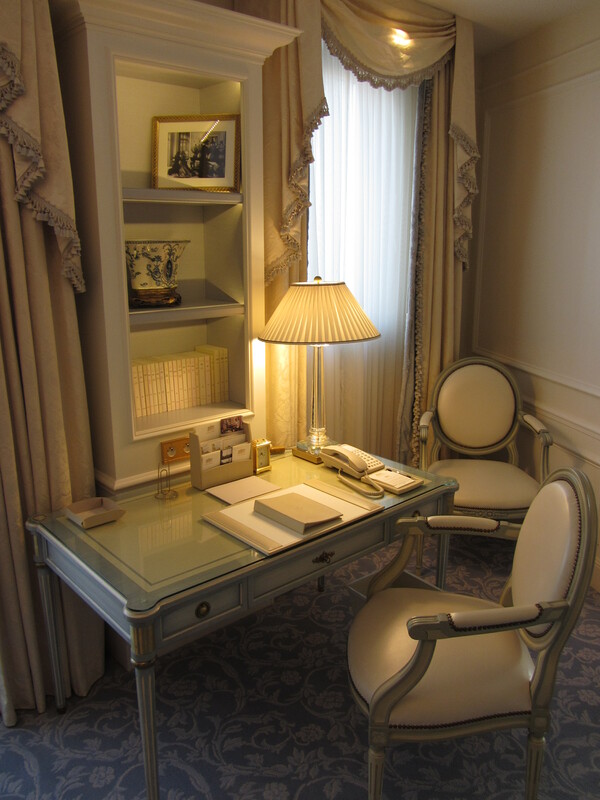 The rooms at the Four Seasons George V are very exclusive and of a high quality! The kingsized bed felt like heaven and the room also had a large desk. 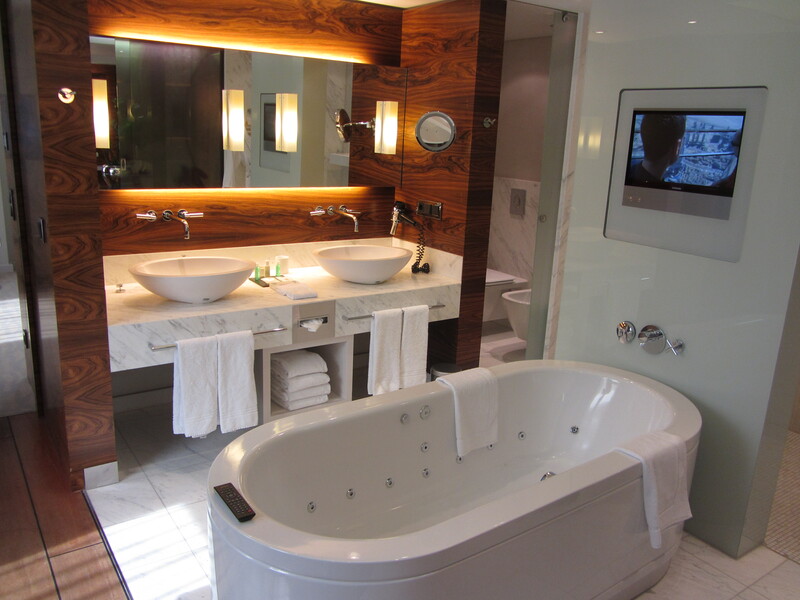 The bathroom with mirror television was temendous and there are bathrobes and slippers for your comfort. 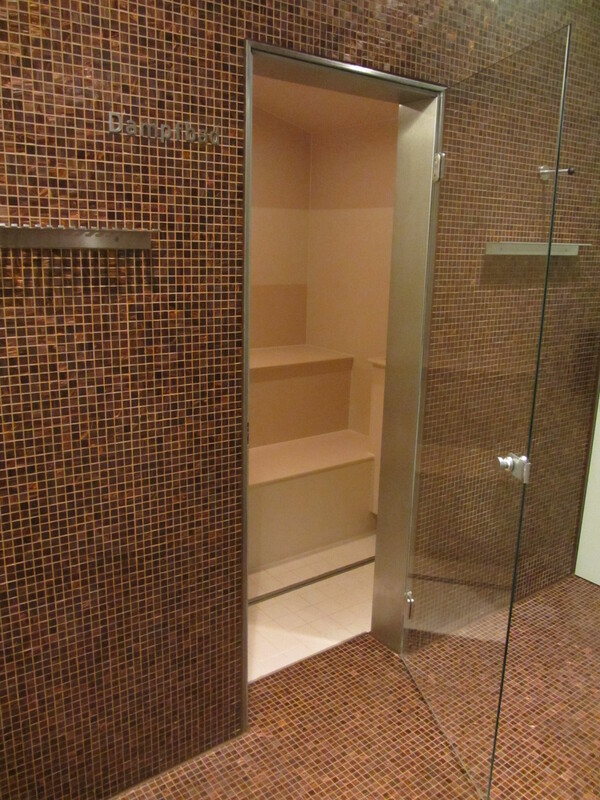 Seperate shower and bath tub, double sink and toilet were very clean. The staff will show you the room and explain how everything works in the room. Free wifi is provided. Getting bored at the Four Seasons George V would be difficult! 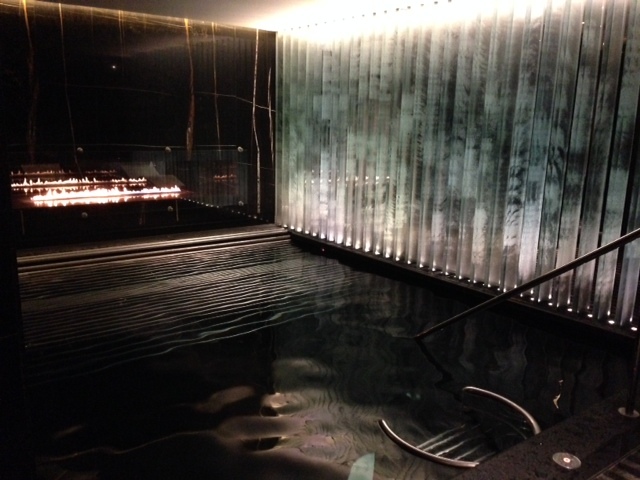 Their spa is probably one of the best Paris has to offer! It’s all about those little things that make this hotel so special. 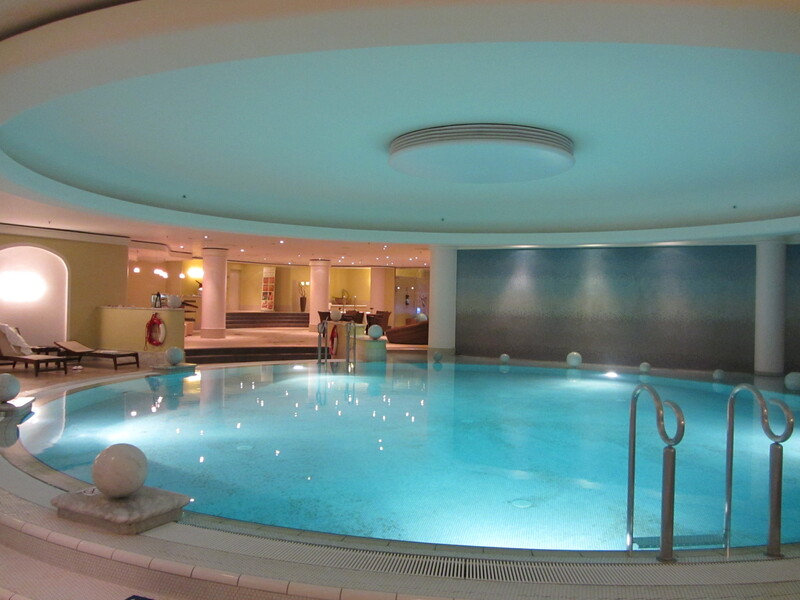 It’s great to relax in the indoor pool after a day in hectic Paris. 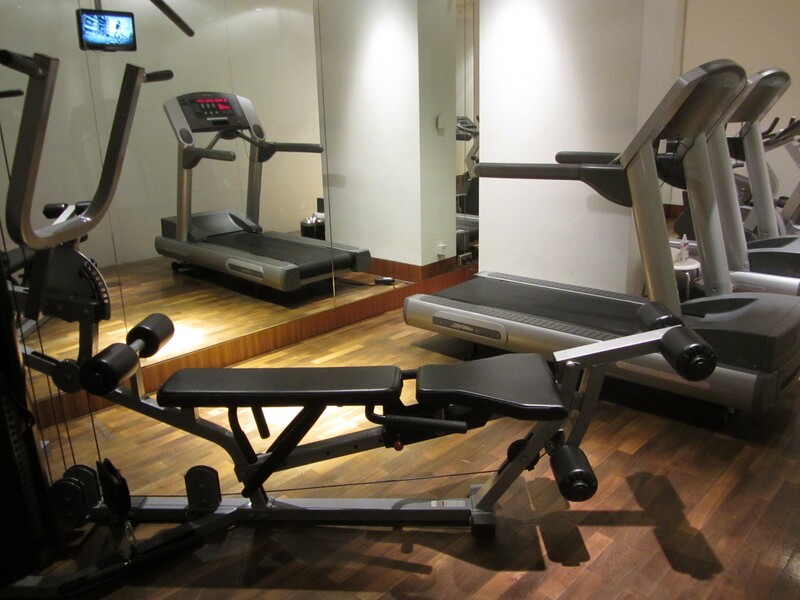 Also a fully equipped fitness center can be used at no additional charge. The shops are great too! 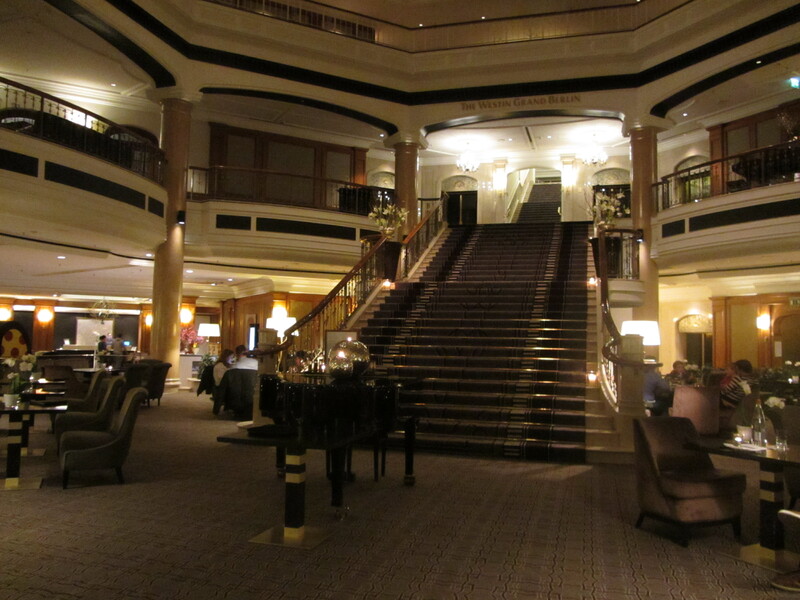 Although this hotel is pretty old, everything is so luxurious. The smell of fresh flowers was fantastic! The restaurants are fantastic. 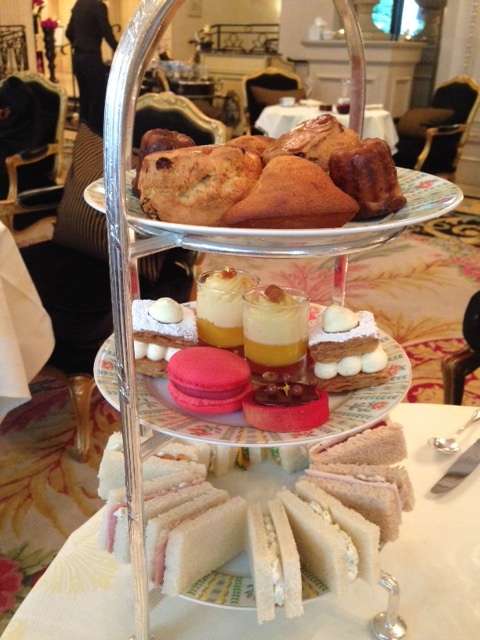 We had an afternoon tea in the Galerie and enjoyed it very much… from the champagne to the little sandwiches. 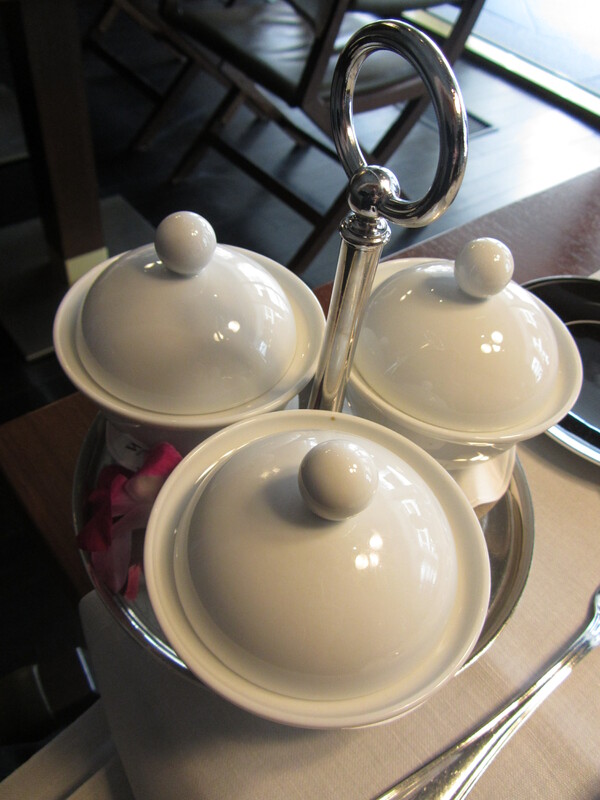 Also, the décor is so nice… Loved the little stools next to the most comfortable chairs for the lady bags! 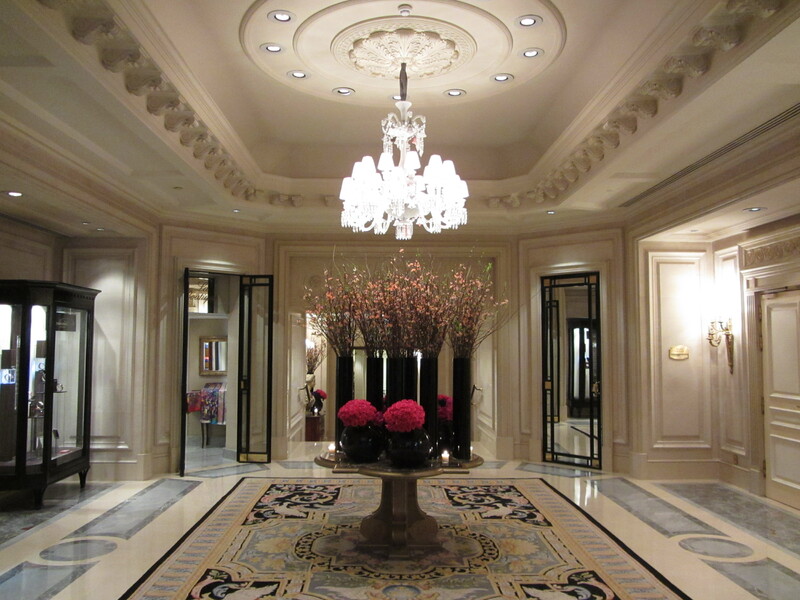 Everything in the Four Seasons George V felt right, highly recommended for an exclusive Paris getaway. Let me first ask you the following: Is there such a thing as perfection? 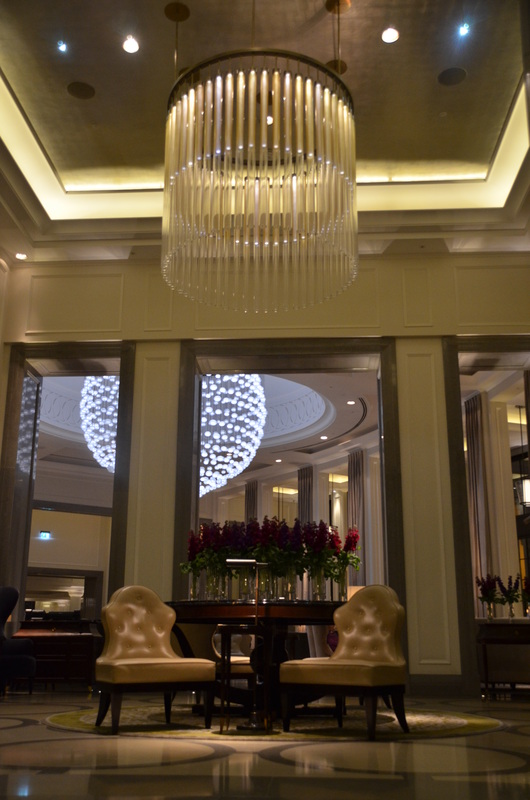 The Corinthia hotel in London is a 5 star hotel, perfectly positioned in the centre of London and is known as one of the very best hotels in the city. Trafalgar Square, the London Eye and Big Ben are all close by (walking distance). You can reach this hotel easily by public transport, taxi or car. 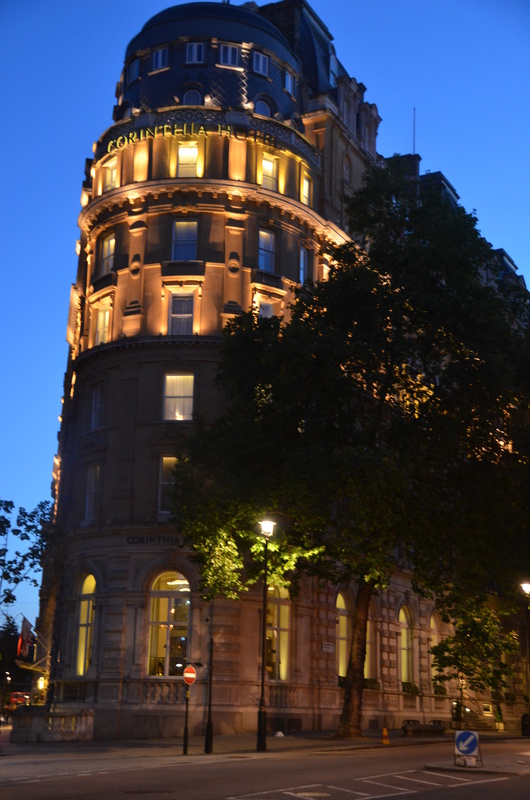 When you reach the Corinthia you will notice the beautiful building. It once was the majestic hotel Métropole, which opened in 1885. Later it became the building of the Ministry of Defense. 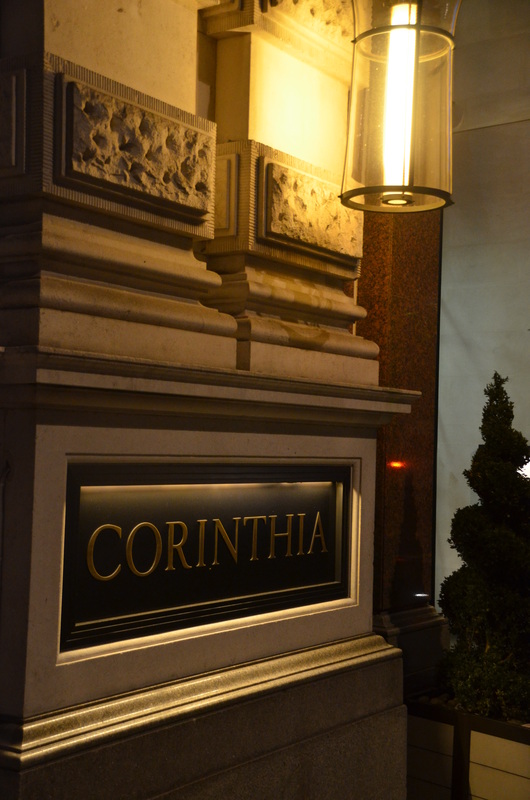 In 2011 the Corinthia hotel in London opened its doors. 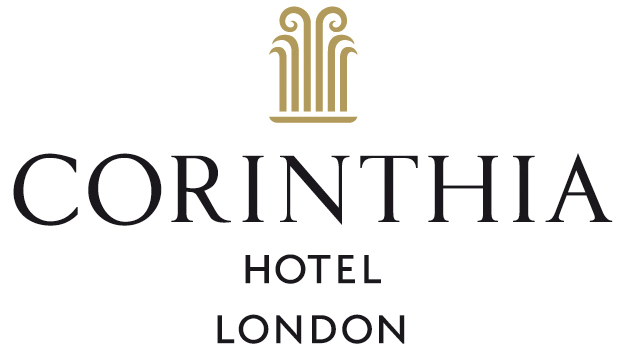 Today it still is the flagship hotel of the Corinthia hotel group offering the most luxurious accommodations in London and even in the entire United Kingdom. 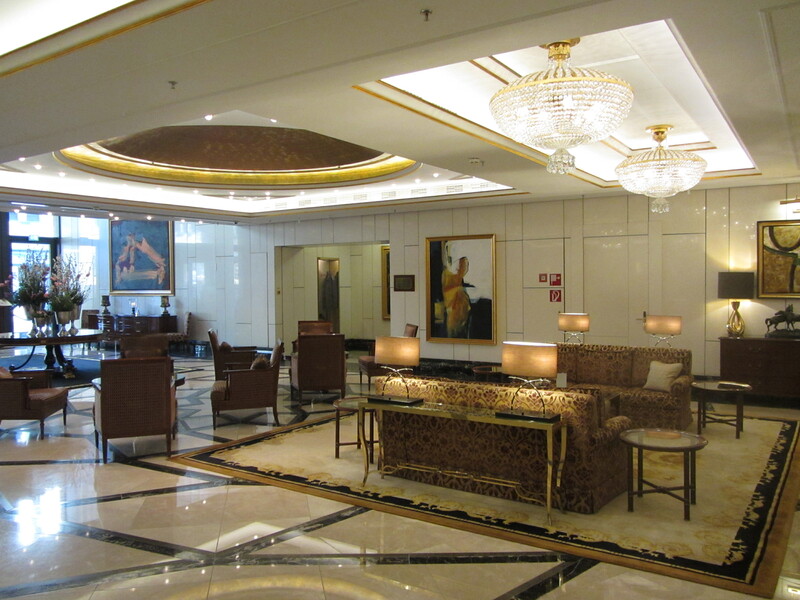 As we entered the hotel, the lobby was one of the nicest we had ever seen. We were greeted immediately with a smile, always nice! 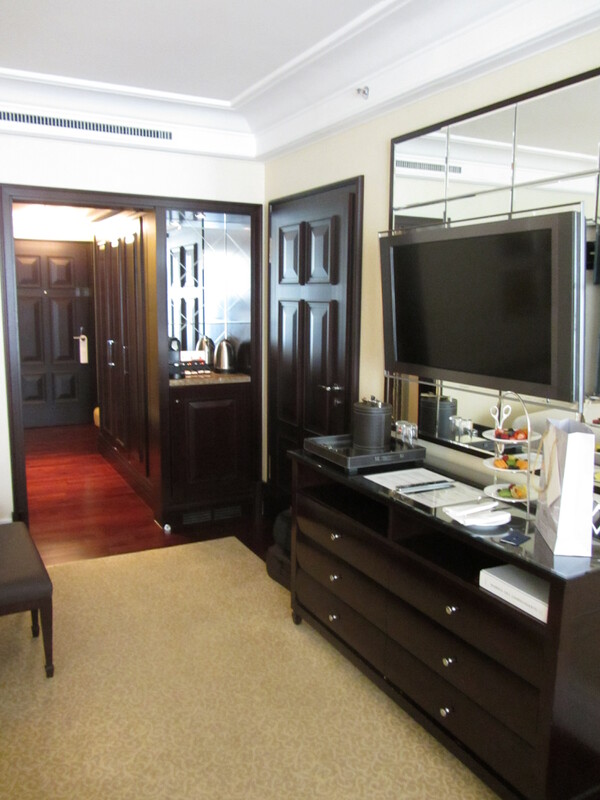 During check-in we were told that we had been upgraded to one of their Junior Suites. A very friendly lady showed us the room and as soon as she opened the door we were very impressed by how unbelievably luxurious and clean those rooms were. It was like this room had never been used before. 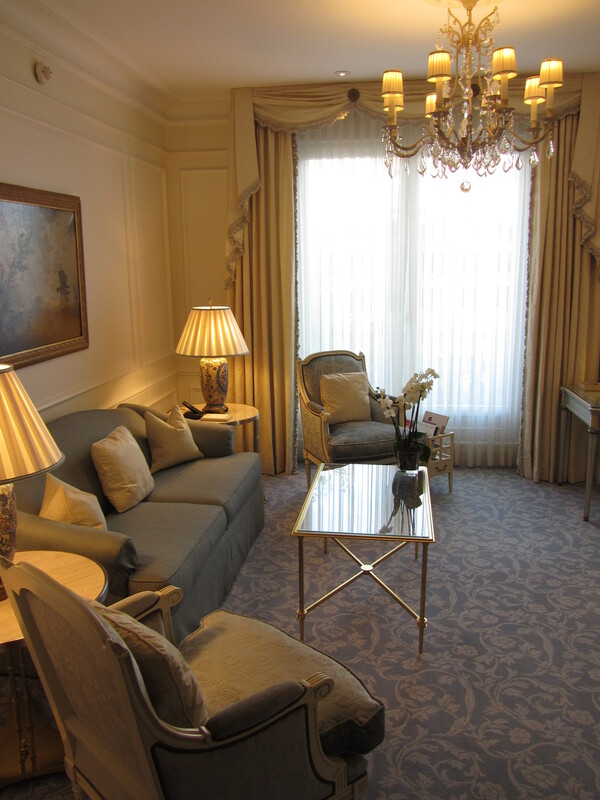 The Junior Suites at the Corinthia London have an average size of 47 m². They all have a “super king sized” bed, a dressing room, a most comfortable sitting area and a chaise longue. The Italian marble en-suite bathroom features an oversized bath tub with in-built high definition tub TV, a separate tropical rain shower and ESPA products. I actually took the ESPA shampoo home with me, it smells and feels SO nice! Never had such great toiletries. 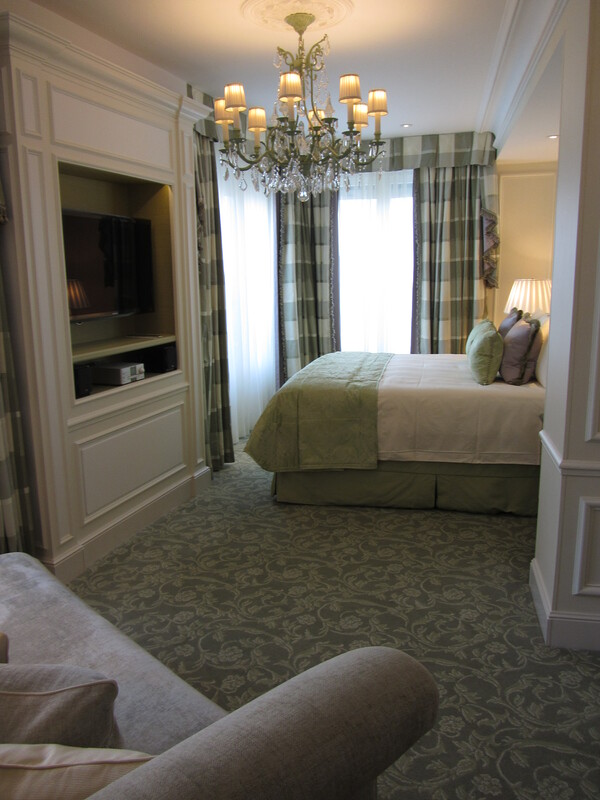 After inspecting and getting a feel of our gorgeous room, we went on to explore the hotel. Believe me that around every corner there is a new surprise waiting for you. This hotel is well known for its service and details and I can understand why. Every single staff member I saw during my entire stay greeted me with a smile and most even remembered my name, which left me very impressed! 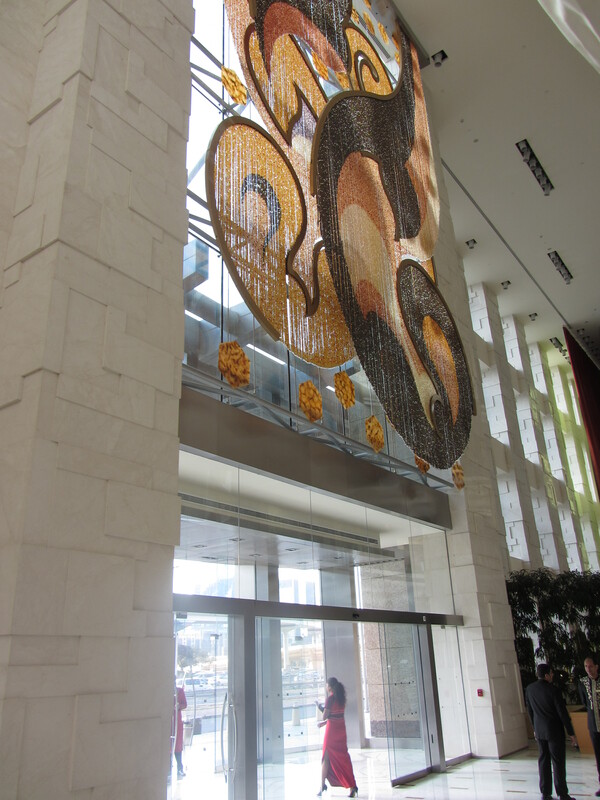 As we went back to the lobby, a staff member showed us around the hotel. 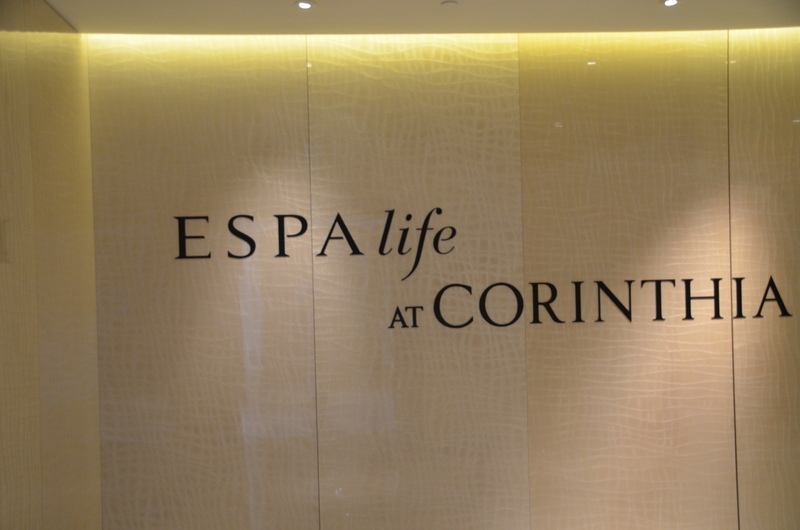 We went to the Spa area and to be honest, I couldn’t believe my eyes when I entered this dream world… In 2013 the ESPA Life at the Corinthia was voted best spa in Europe! 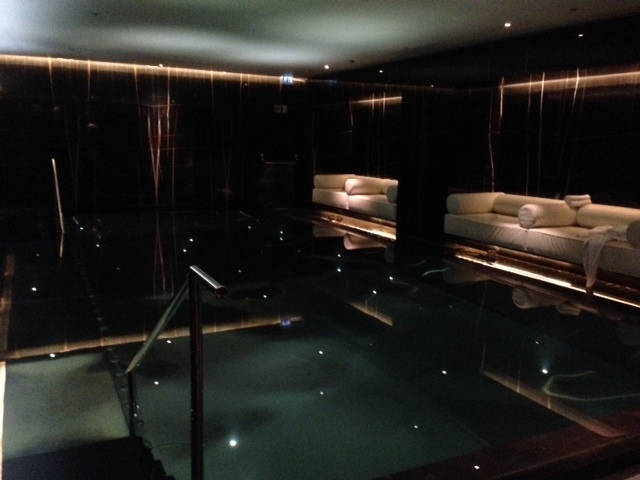 It also is the largest spa in London with 4 floors of black marble luxury. There are 2 pools: one steel 9 meter swimming pool and one vitality pool, a large amphitheatre-style sauna and steam room, marble heated relaxing chairs, ice fountain and so on. There are relaxing areas all over the place. 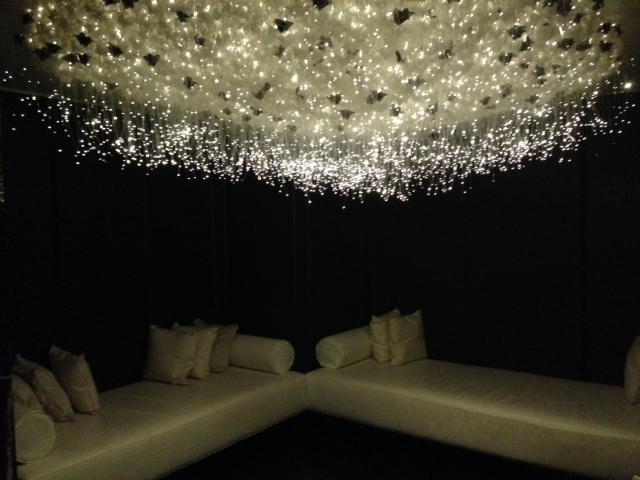 You should definitely check out the “sleep pods” with the central fire place in the changing rooms: these are very quiet and intimate spaces where you can chill out while enjoying relaxing music, fresh fruit and water. 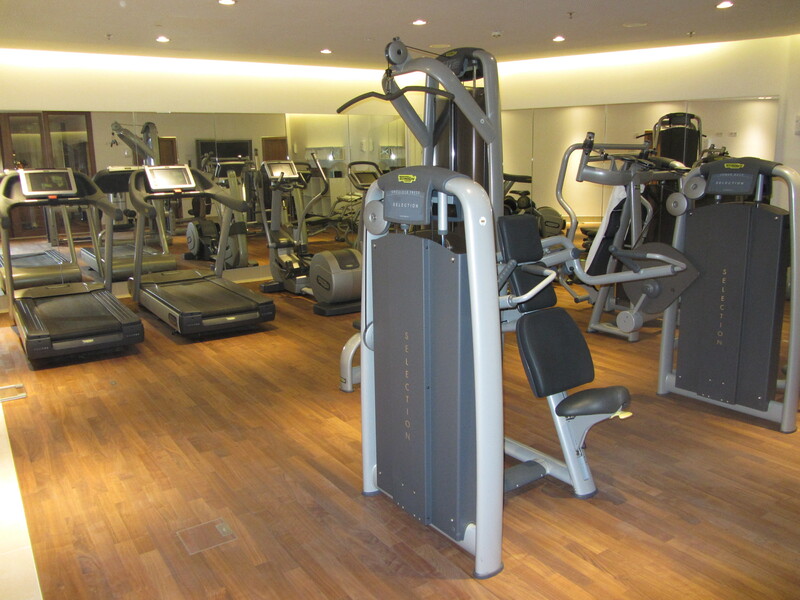 The fitness room is well equipped with high class training facilities. There are personal trainers on duty as well. Oh, and don’t bring your own headphones, they have some right there waiting for you. 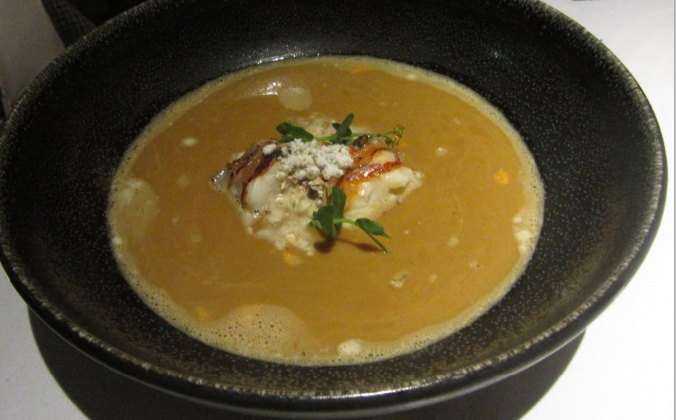 The Corinthia London has 2 restaurants: the Northall (British cuisine) and Massimo (Italian cuisine). 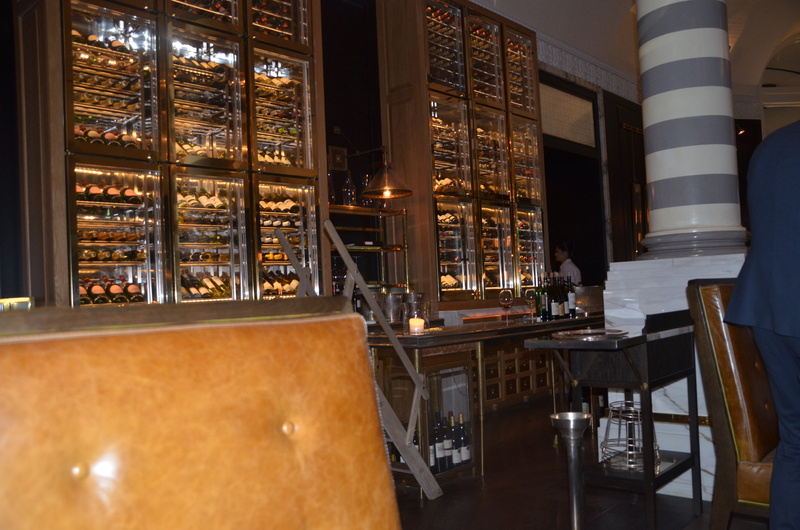 We had dinner at Massimo. 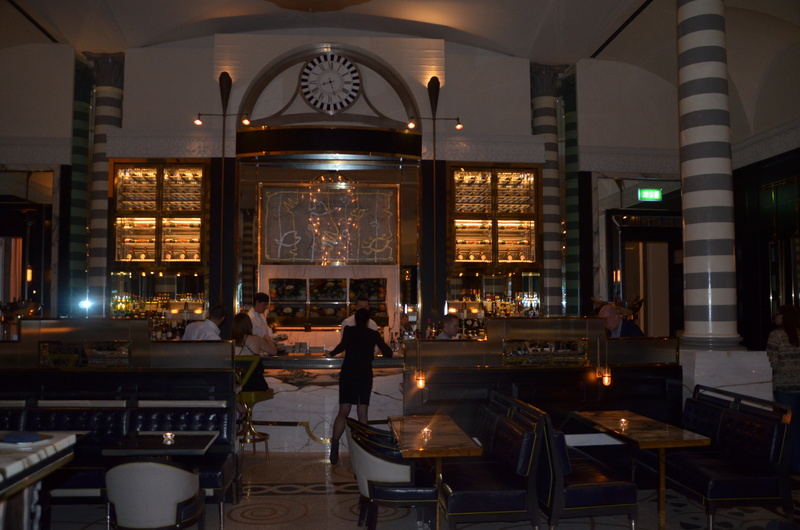 The restaurant is beautifully decorated and truly has this Italian vibe. The food was delicious. I can highly recommend the beef carpaccio, which was the best I’ve ever had! Service again was top-notch, not snobby and they really make you feel at ease. Very nice! The sommelier is a very kind guy with an outstanding knowledge of wines. 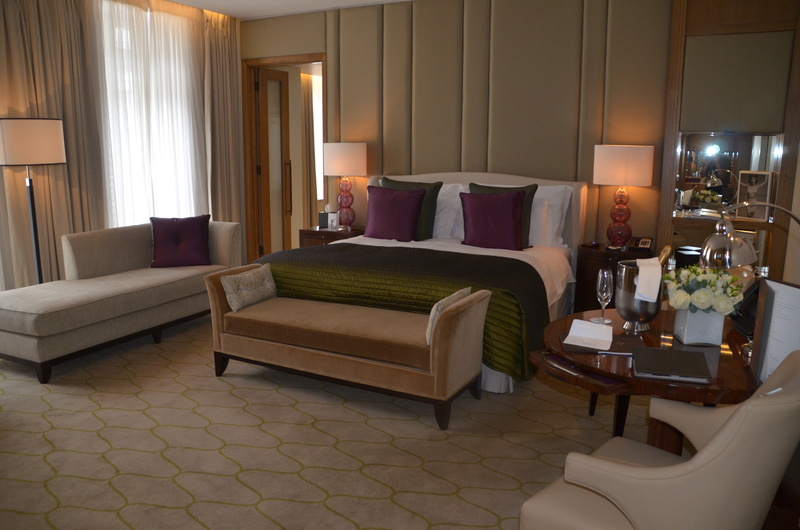 The Corinthia in London is not just a hotel, staying here truly is an experience. After having stayed at many hotels, I was really impressed by this one! 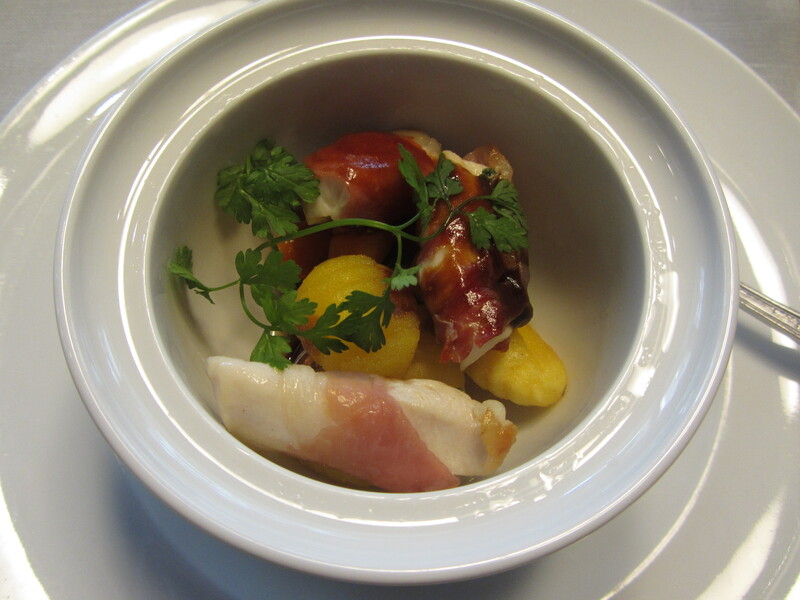 It offers a perfect mix of elegance, gorgeous rooms, delicious food and the most attentive staff. 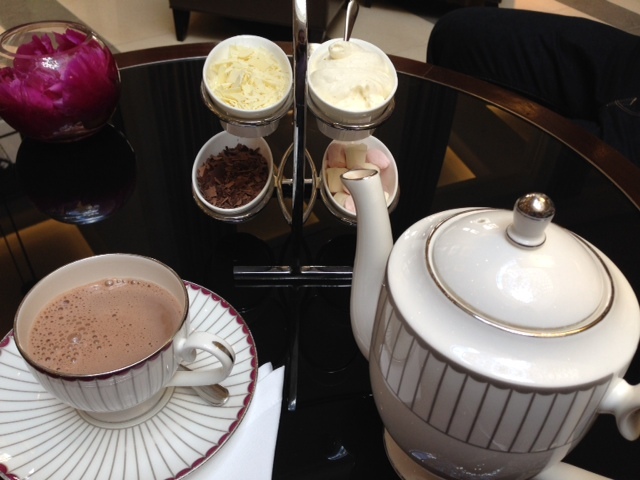 Perfection does exist and I can easily understand why the Corinthia is rated as one of the very best hotels in London! 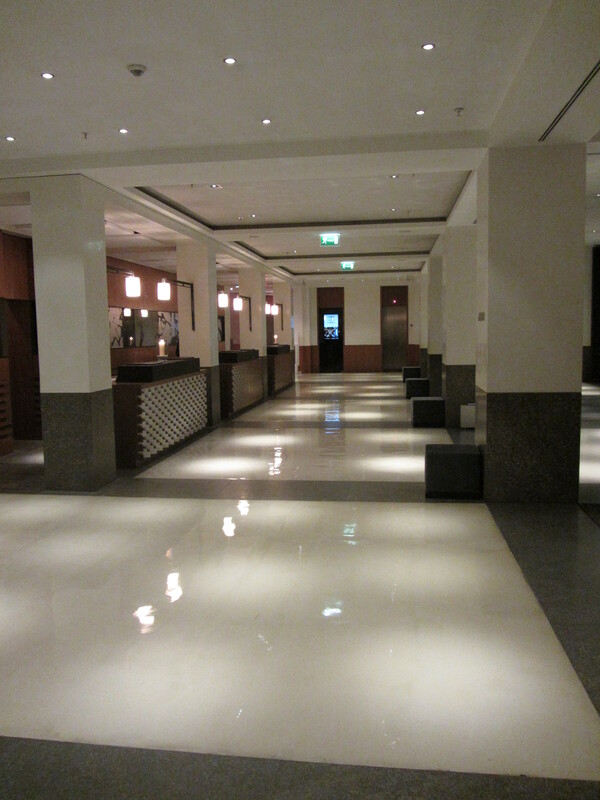 The Westin Grand Berlin is one of the icon hotels of the city! You can’t beat the location, the hotel is located within walking distance of the major attractions Berlin has to offer like the Brandenburg Gate, Kaiser Wilhelm Memorial Church and the Bellevue Palace! This seven-story hotel has 400 rooms and is only 14 km from the Tegel International Airport. 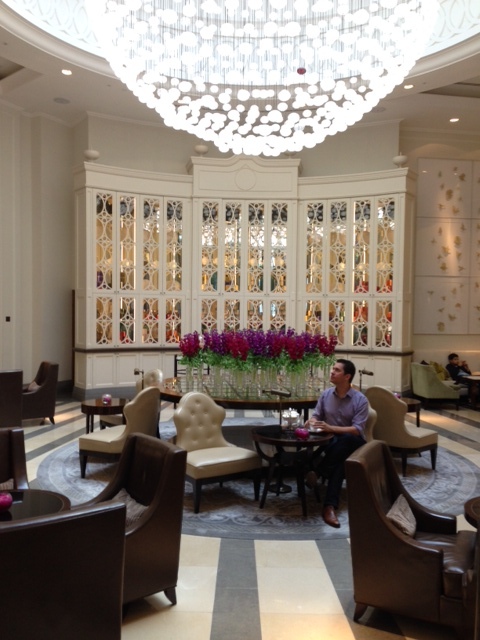 The lobby is one of the nicest I have ever seen! 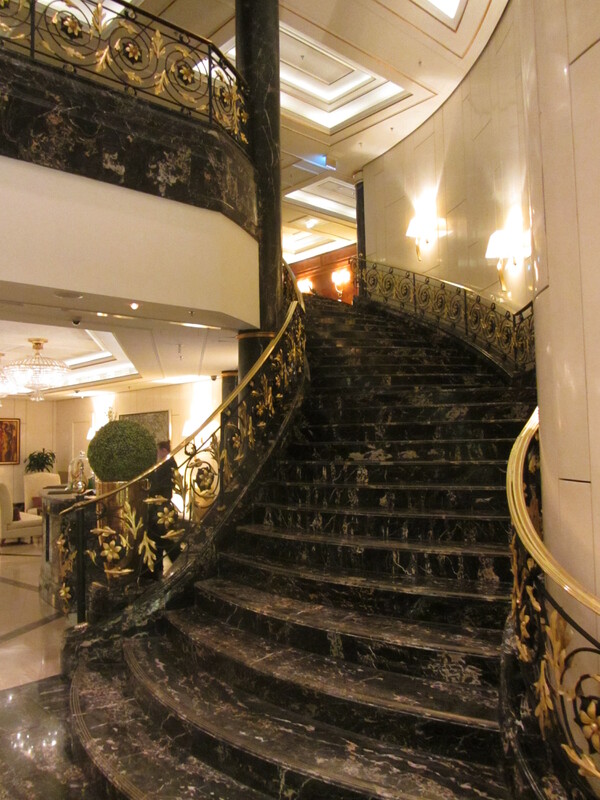 It really is an impressive lobby with a large staircase. There are lots of seating areas with the most comfy couches. I had to work during my stay and went downstairs with my laptop since it is such a lovely place to hang out J Great drinks too, by the way! 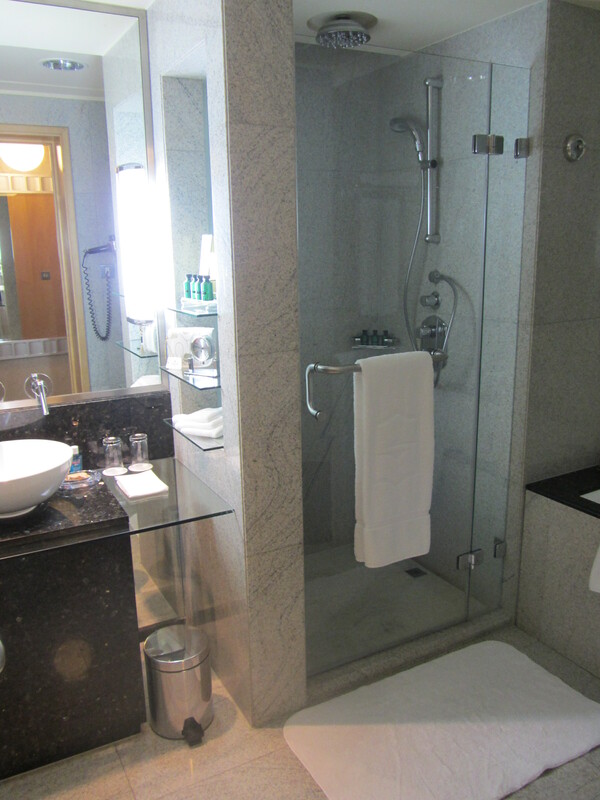 Rooms of the Westin Grand Berlin are of a 5 star level. I had a great night’s sleep, the beds are great! The room had a good size and had all the amenities I needed such as a great minibar, comfy lounge chair, desk and a good wifi connection. 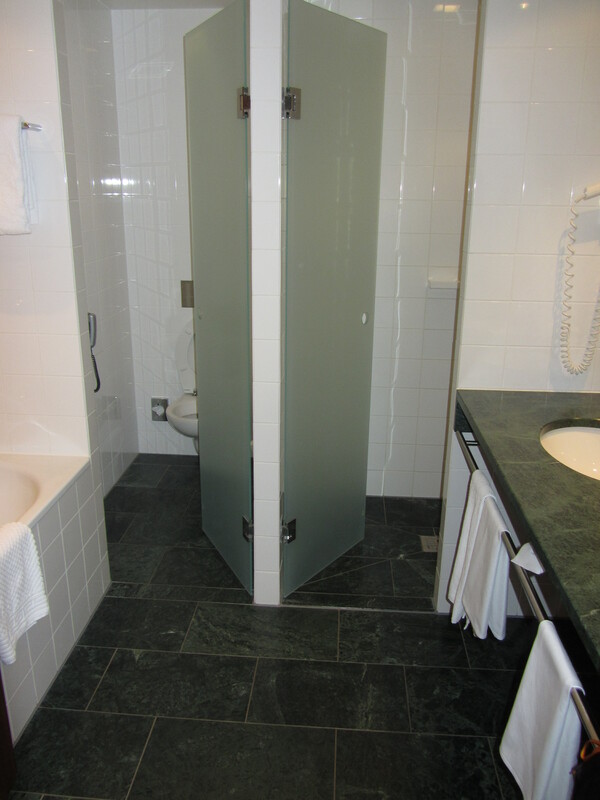 Bathroom had single sink, (rain) shower and toilet. The décor was nice, not too modern and not too old fashioned. 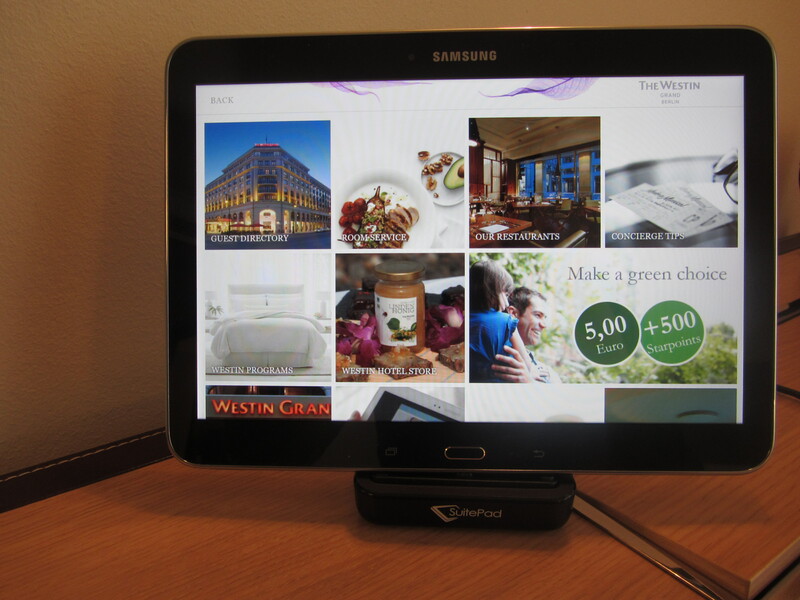 There was a tablet in the room which was very handy, all the information about the hotel can be found on it and making reservations is so easy. 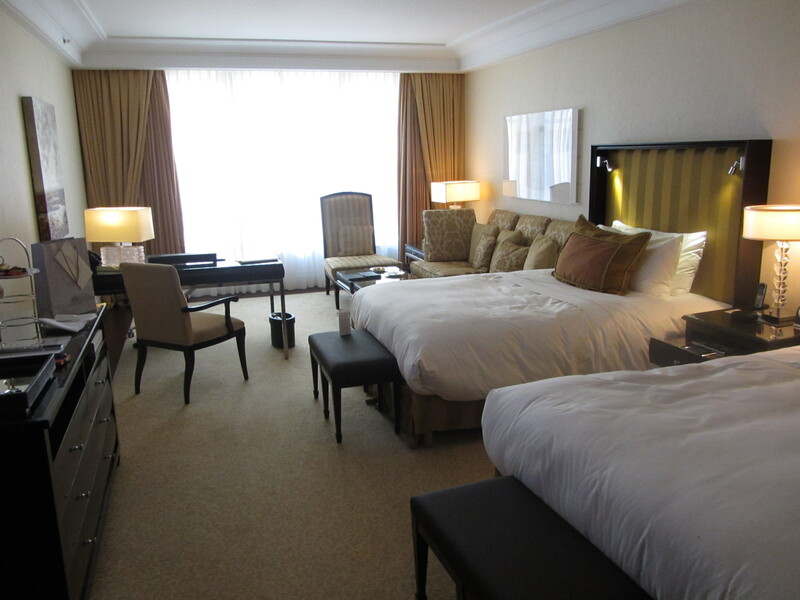 Of all the hotels I visited in Berlin, I liked the rooms of the Westin Grand the most! 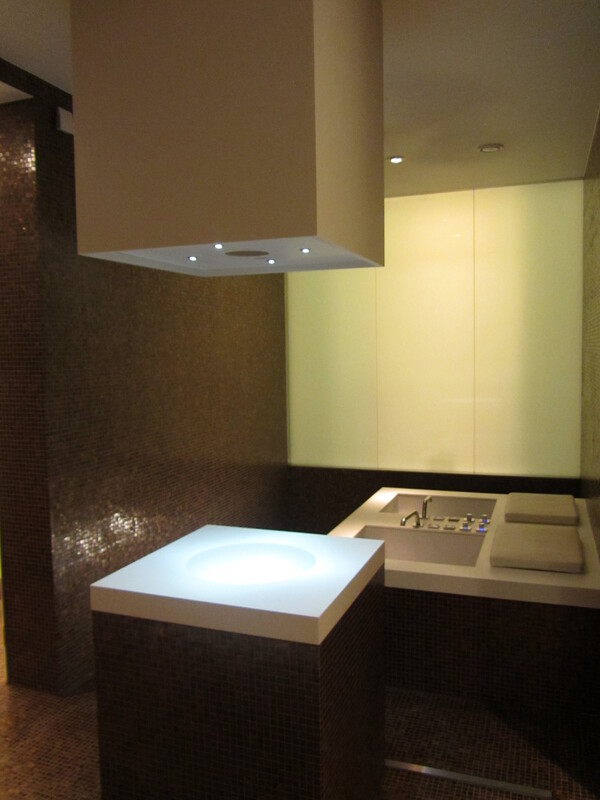 We did visit some suites… The spa suite, for example, is just awesome! 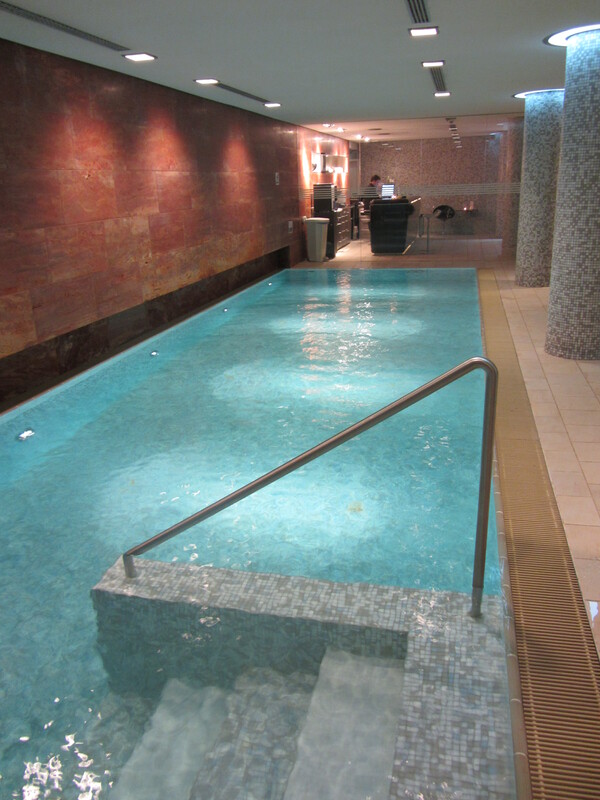 After a day in beautiful Berlin, the spa area (accessible with separate spa-elevator) is the place to hang out! 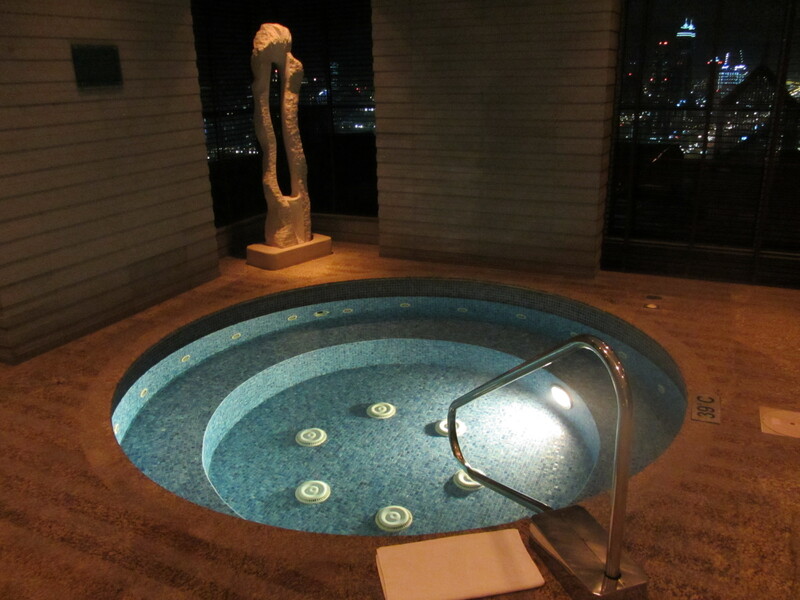 The hot tub and indoor pool can be used at no additional charge. There is a small fee for the sauna. Bathrobe and slippers can be found in the room. 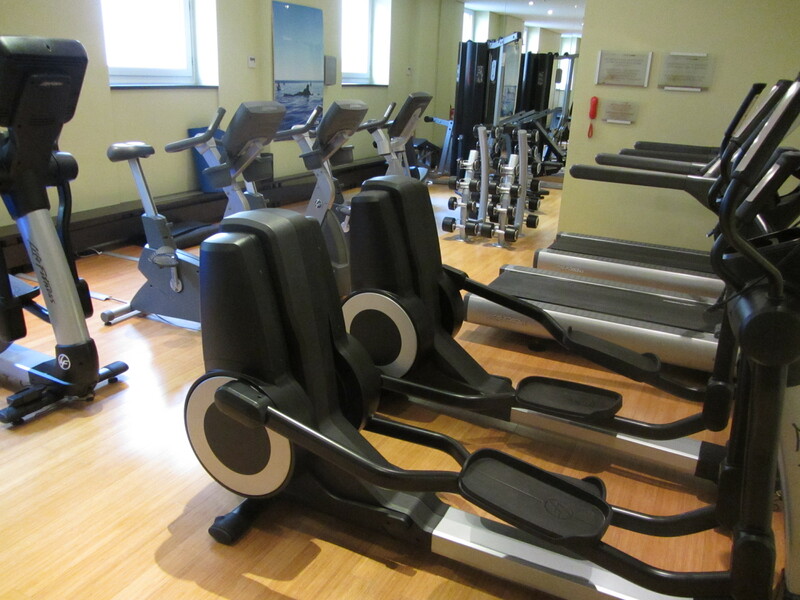 Also, a full fitness center is available and can be used at all times. 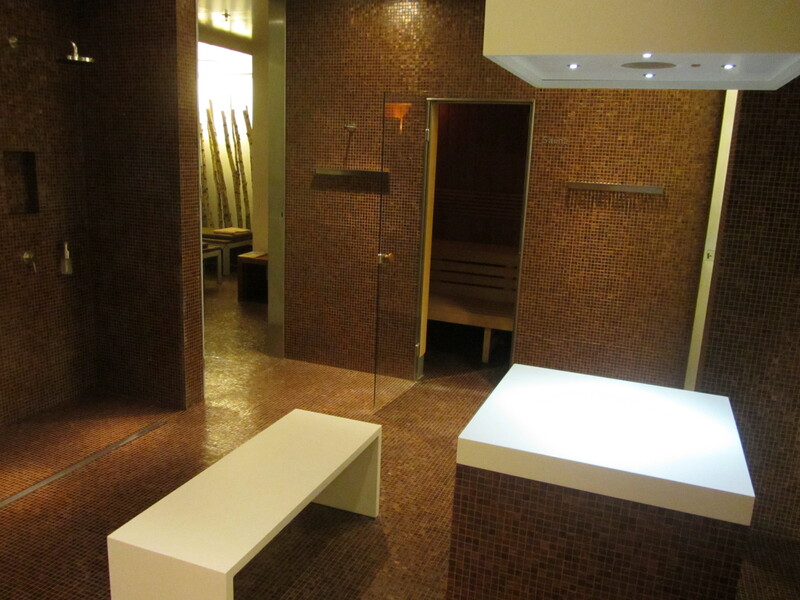 I really liked the spa area, it was a relaxing place and never was too crowded when I was there. The pool is just beautiful and quite large. Temperature of the water was excellent! I looked at the spa menu and they offer a lot of beauty treatments and massages at affordable rates. 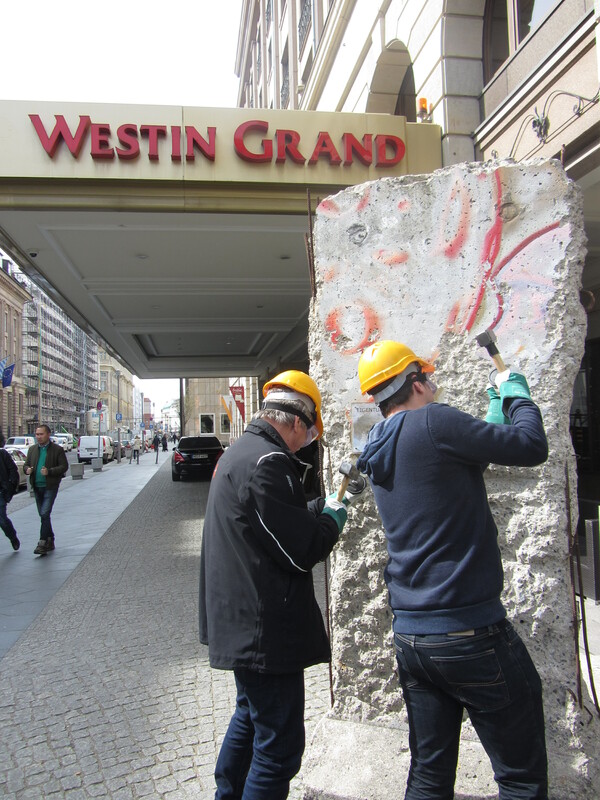 They offer the “Tear down the wall” package where guests have the chance to chip an own historic keepsake out of a segment of the original Berlin Wall located in front of the hotel. Afterwards, you will receive a photograph and a certificate of authenticity as well as refreshments in the form of Berlin-style curried sausage and a glass of Champagne. We did the wall picking activity and thoroughly enjoyed the experience! It is so much fun… and really unique! Loved it! 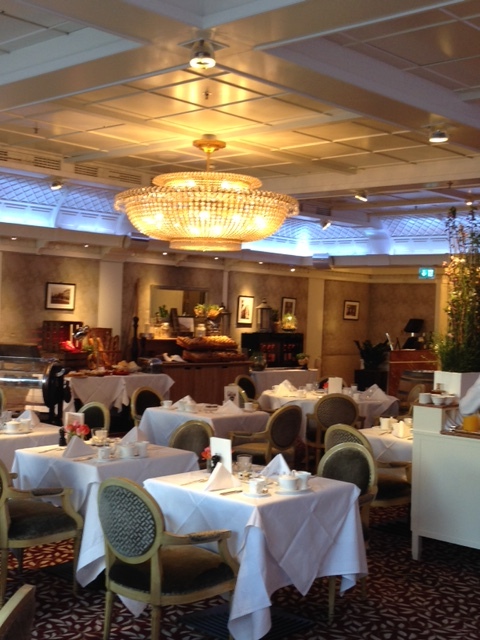 The Westin Grand Berlin has 2 restaurants: Relish and one restaurant for breakfast. We had lunch in Relish and enjoyed every single dish! 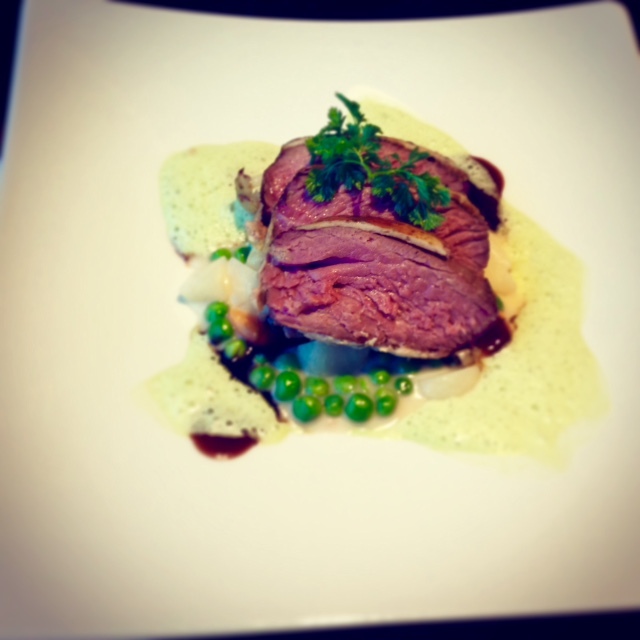 The business lunch is outstanding and at a fair price. Oh, and do try their traditional “currywurst”, you are in Berlin right?! It is delicious! Breakfast was great too with a large selection of both hot and cold items. Sparkling wine is offered as well at no additional charge. The Westin Grand Berlin impressed me, it is one of the best hotels in Berlin and I felt at home… which is quite unique. Can’t wait to go back again! Life is magnifique? It sure is at the Sofitel Berlin Kurfürstendamm! 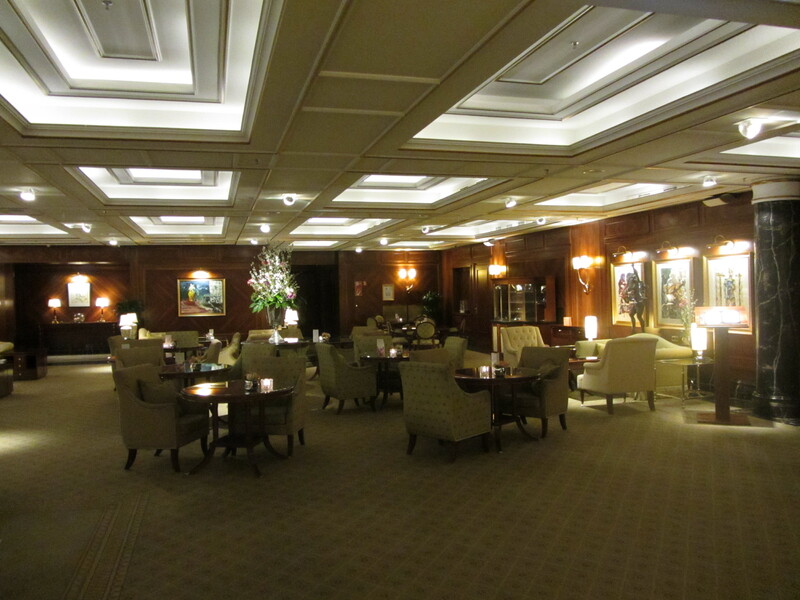 This 5 star hotel is located in a very central spot in Berlin surrounded by shops and historic sightseeing must-sees. 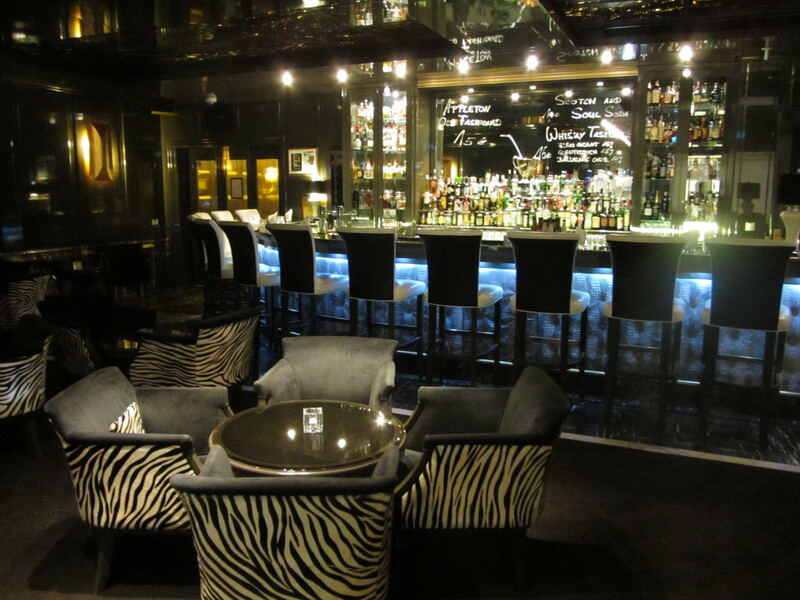 It is fully operated by Sofitel since February 2014 (it used to be the Concorde hotel). The Sofitel Berlin Kurfürstendamm is within walking distance of the Berlin statue and the Kaiser-Wilhelm-Gedächtenis-Kirche. Actually, before I got here I wasn’t sure if I would like this side of Berlin, but actually I loved it! There is so much to do in this neighborhood. We stayed in a deluxe twin bedroom. The room had a good size. 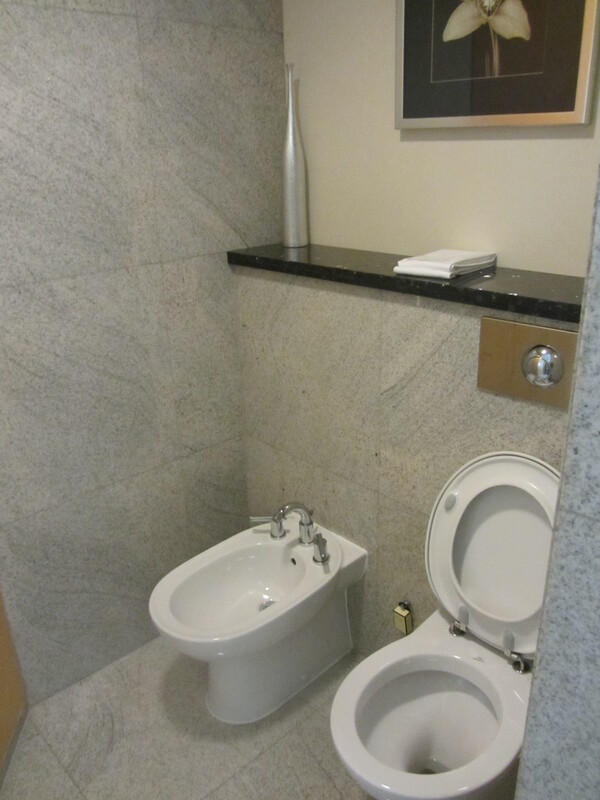 Bathroom has double sinks, separate shower, separate toilet and bid. 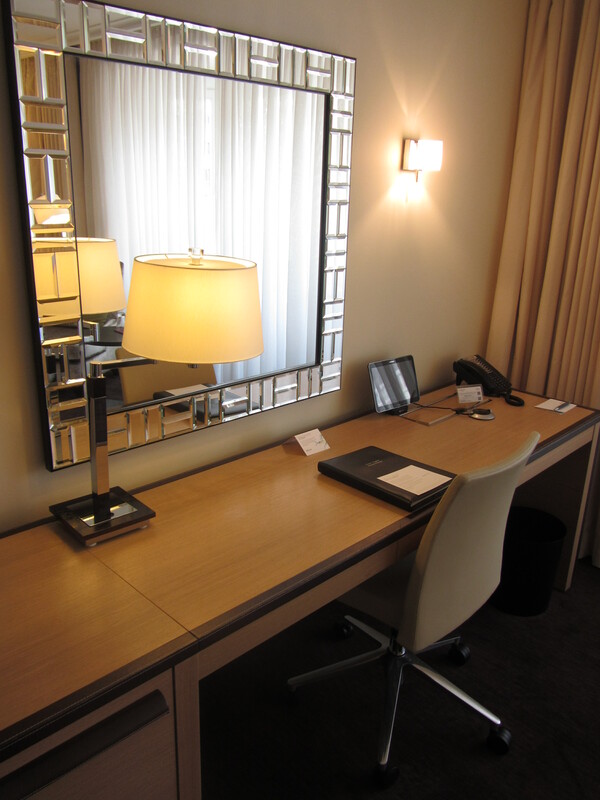 The rooms at the Sofitel Berlin Kurfürstendamm are about the largest Berlin has to offer. The decoration is modern and also has this “Asian” feeling without being over the top. 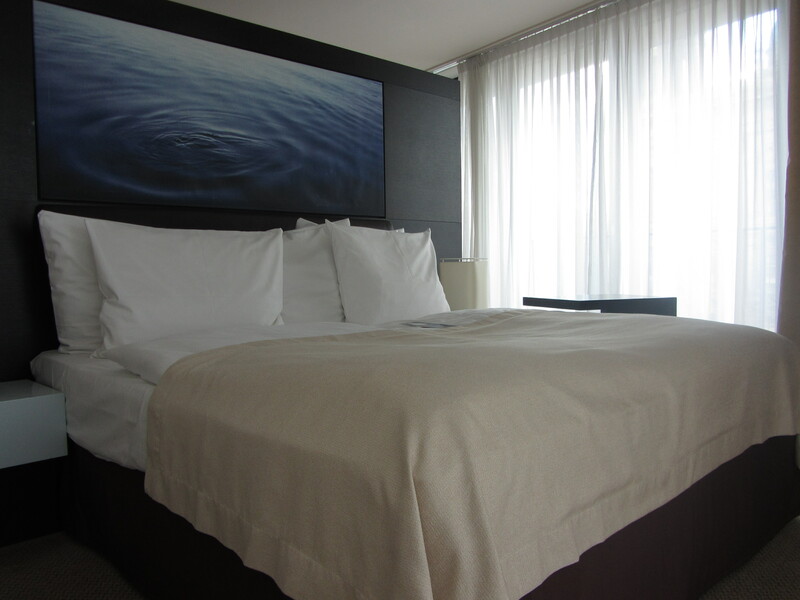 Some of you may already know the MyBeds Sofitel offers to their guests? It always is a pleasure to sleep in one of their beds! It feels like sleeping on a cloud and it is so relaxing after a day of walking in the city. 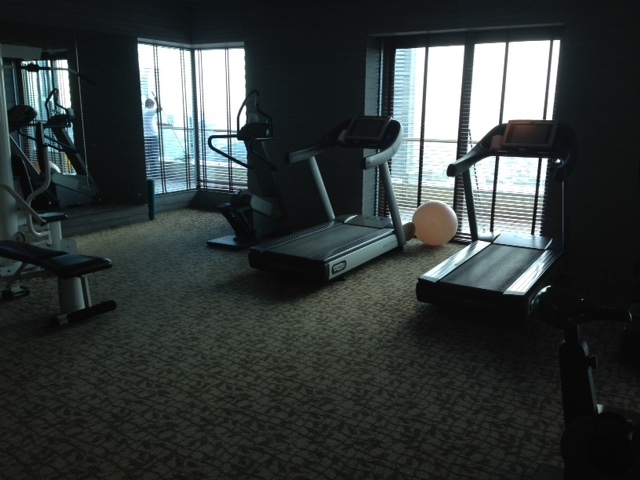 Before dinner, I wanted to lose some calories so I went to the gym on the second floor. 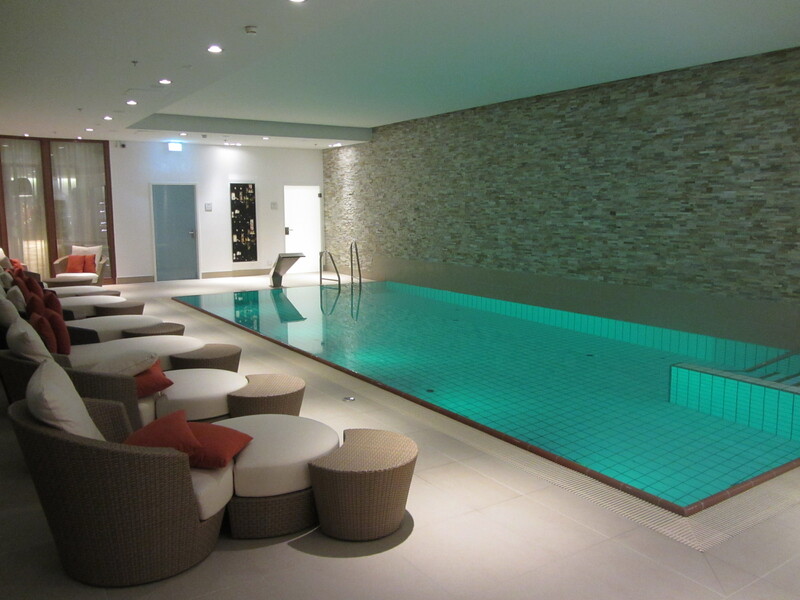 The hotel offers great fitness facilities and a fully equipped spa area with sauna and steam room. After working out it is great to chill down in the relaxing area with comfortable chairs. 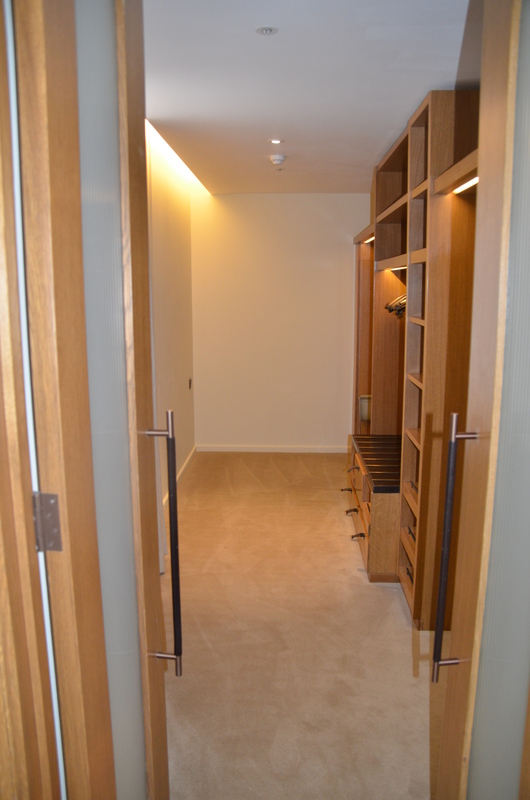 Bathrobes and slippers can be found in the rooms. 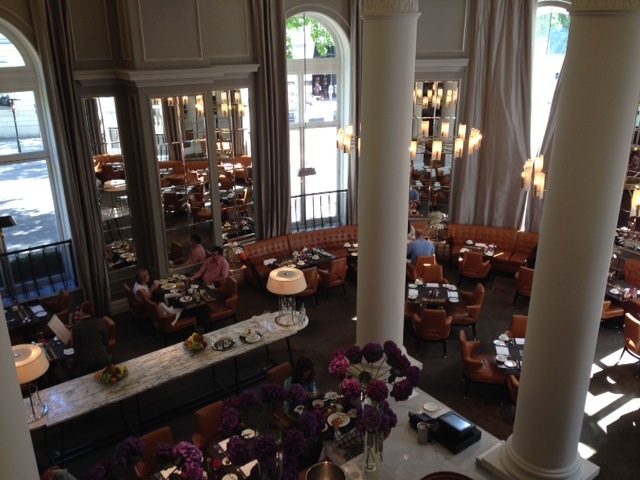 The Sofitel Berlin Kurfürstendamm has 2 restaurants: the Faubourg (French cuisine) and a restaurant for breakfast. 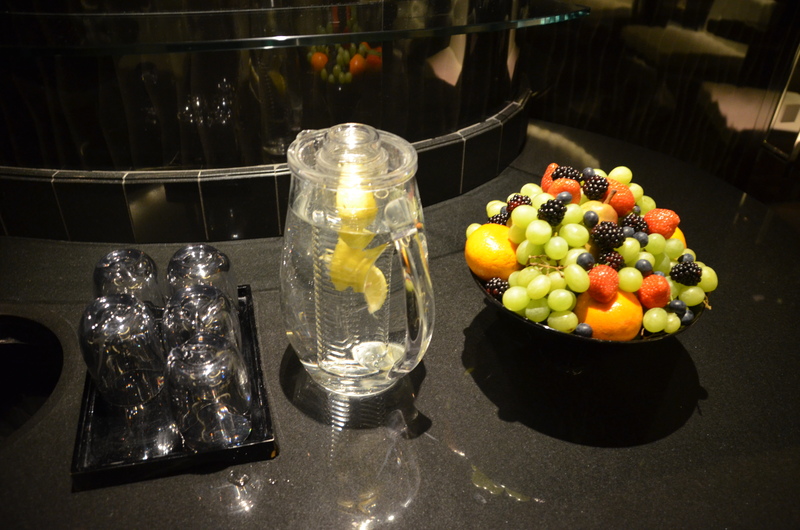 In the lobby bar guests can have light snacks and meals. 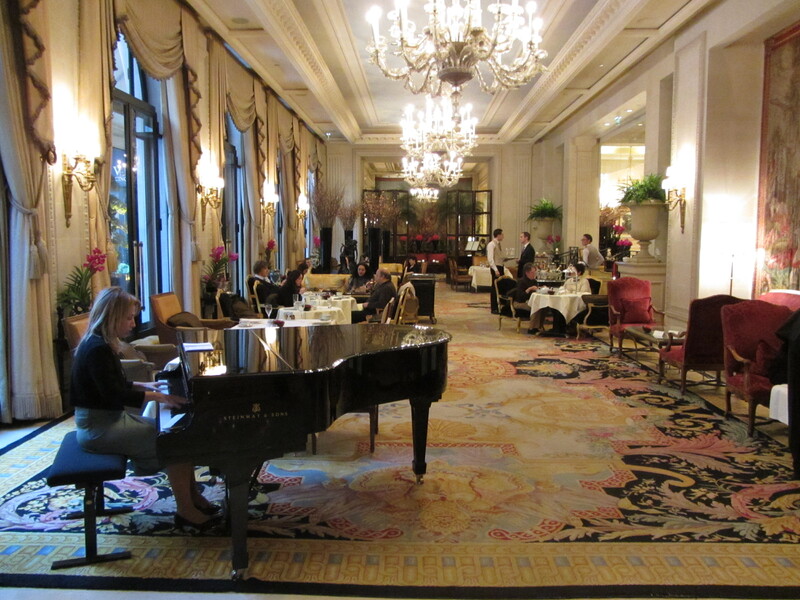 We had dinner at the Faubourg, but had a cocktail in the lounge bar first. I had a mojito and to be honest, it was one of the best ones I have ever had (and I am a mojito addict so I know what I’m talking about :)). 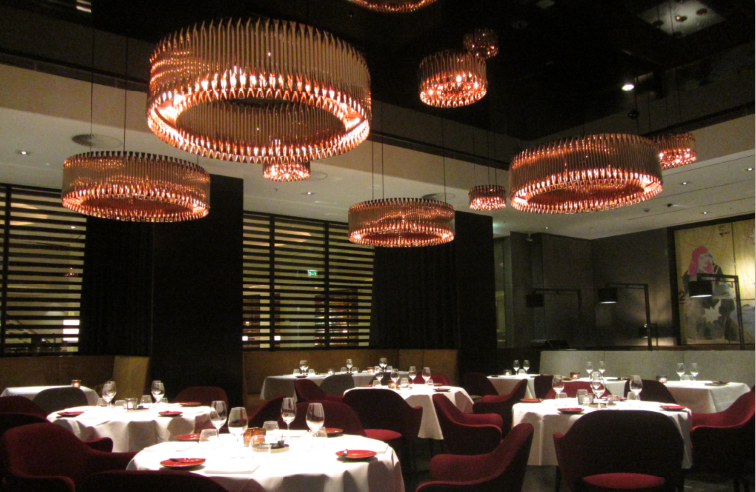 The restaurant is beautifully decorated and truly has this modern and young vibe. The food was delicious. 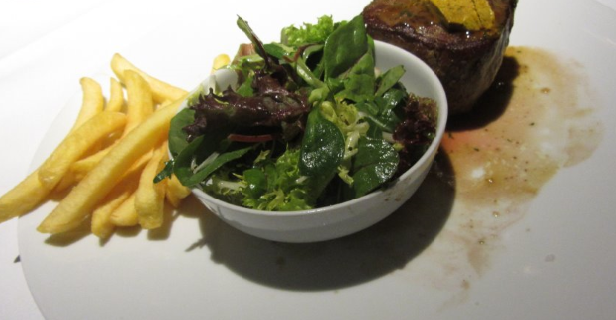 I can highly recommend the filet steak with Café de Paris butter, which was (again) one of the best I’ve ever had! Service again was top-notch, not snobby and they really make you feel at ease. Very nice! The sommelier is a very kind guy with an outstanding knowledge of wines. Breakfast was good (as always – it is a Sofitel) and all the items were fresh and of a good quality: sparkling wine, lots of sweet items (waffles, pancakes, etc. ), fruit, etc. 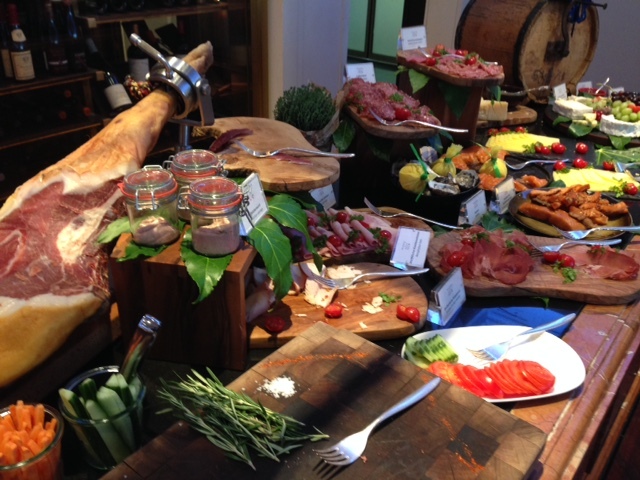 Very large buffet with excellent service! 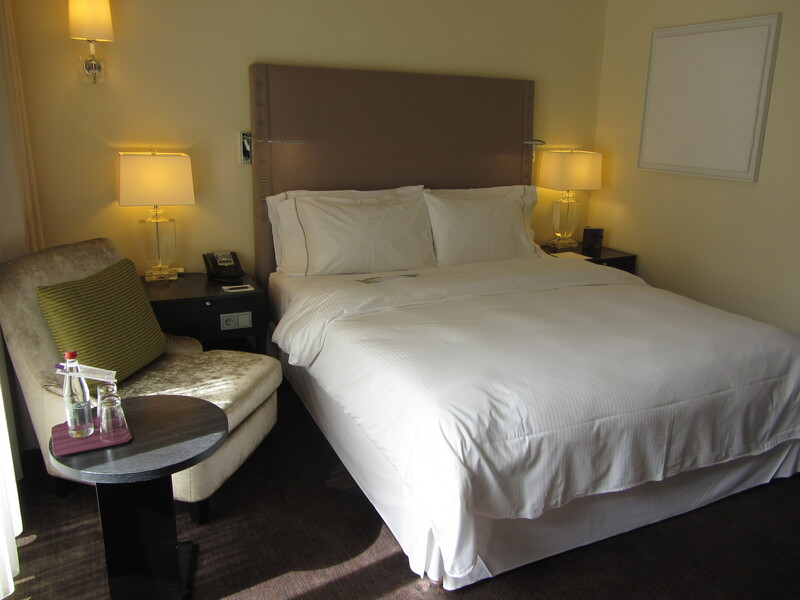 I recommend staying at the Sofitel Berlin Kurfürstendamm, great rooms, great food and heavenly beds! Just a few steps away from the Berlin Cathedral, the Radisson Blu is located in a perfect spot in Berlin! This 5 star hotel is one of the top hotels in the city and offers luxurious rooms and great spa facilities in the “middle of it all”! 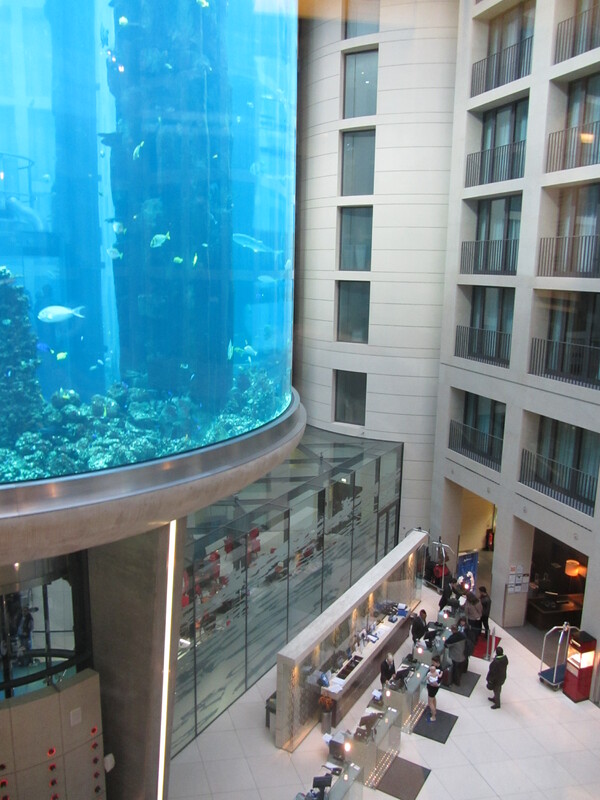 As soon as you enter the hotel, you will be amazed by the large aquarium in the lobby area. Actually, it is the world’s largest cylindrical aquarium! Very spectacular! 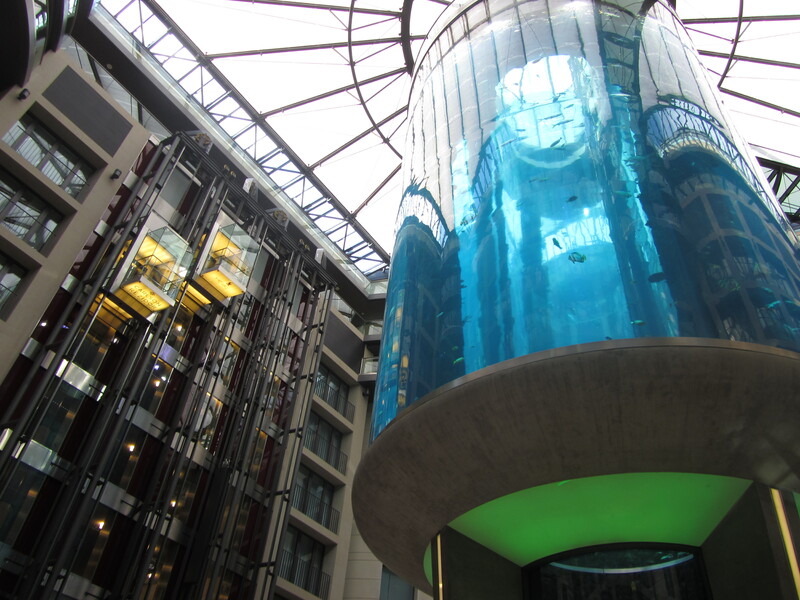 It is a 25 meter tall aquarium with a built-in transparent elevator. The aquarium is the main attraction of the Berlin Sea Life Centre. 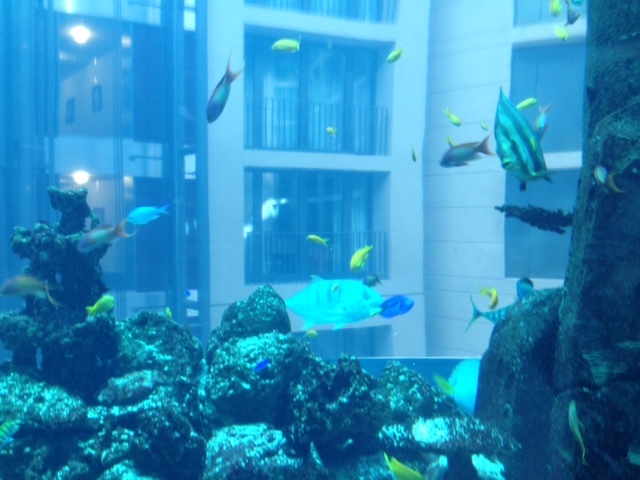 By the way, they feed the fish several times a day, it is fun to watch! Check-in procedure was efficient and friendly. They will give you all the information you need about the hotel and surrounding areas. We stayed in one of their junior suites. These corner rooms are very spacious (47 m²) and have a separate sitting and sleeping area, a large desk and king sized bed. 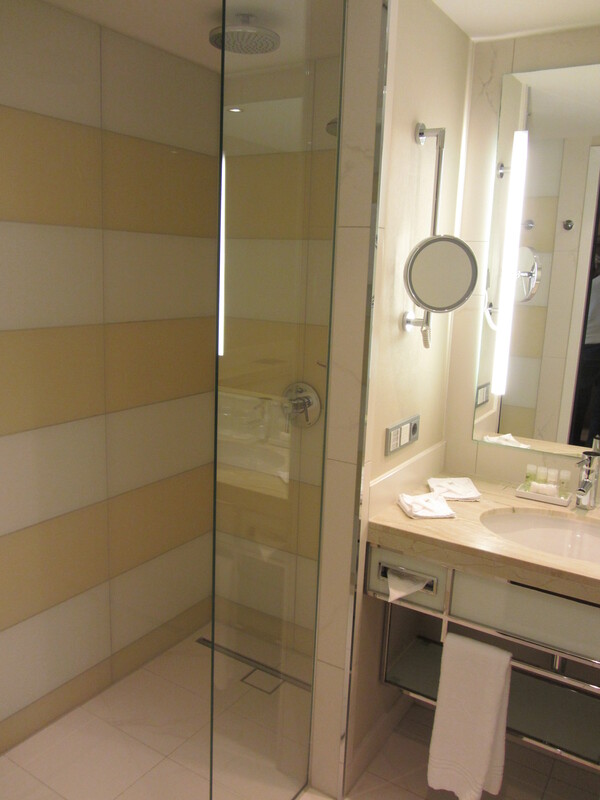 The bathroom had double sinks, separate bathtub and shower. 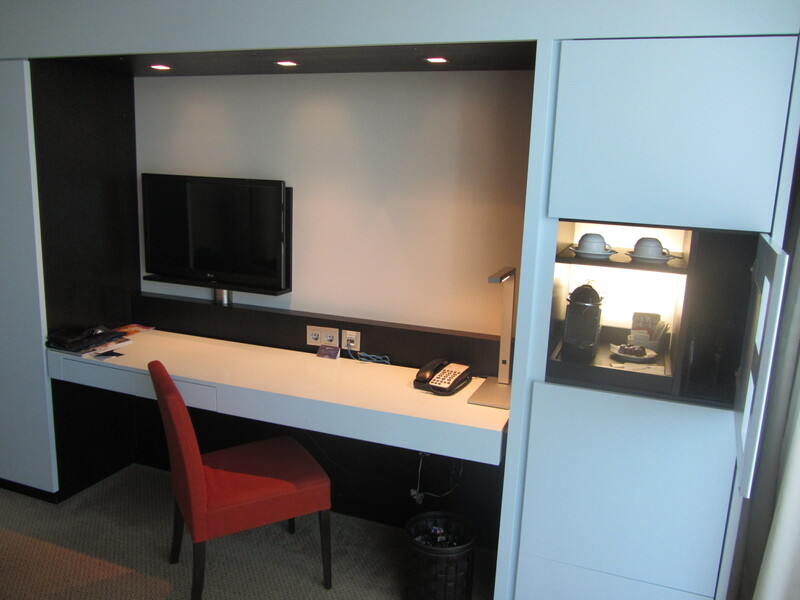 I appreciated the 2 flatscreen televisions and fully equipped minibar and Nespresso machine. There is a spa area with a (small) swimming pool. Is there a better way of starting your day with a swim? 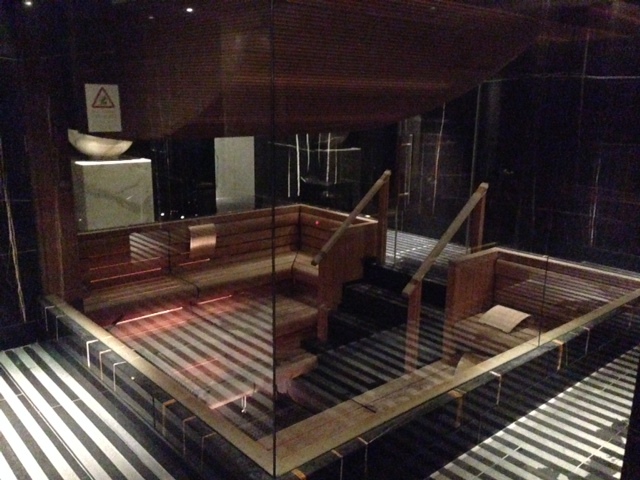 I also used the sauna and fitness facilities which I thoroughly enjoyed. I should also mention that the place couldn’t have been cleaner. 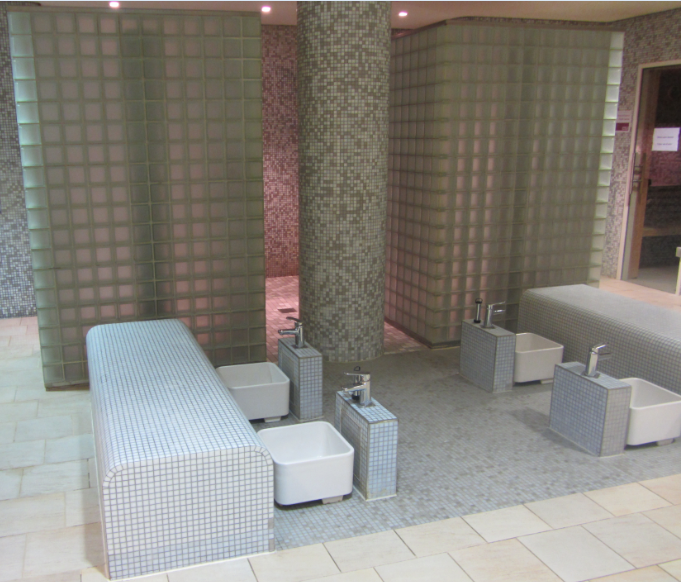 Towels and slippers are provided at no additional charge. The good thing is that the pool and sauna can be used from 6 am till 10 pm. 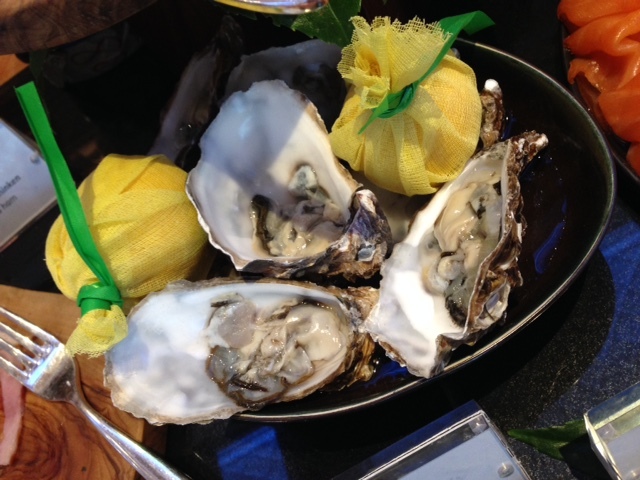 As usual, a breakfast at a Radisson Blu is always a good one! I liked the selection of food and didn’t had to wait too long when I ordered something. Staff was helpful and friendly. 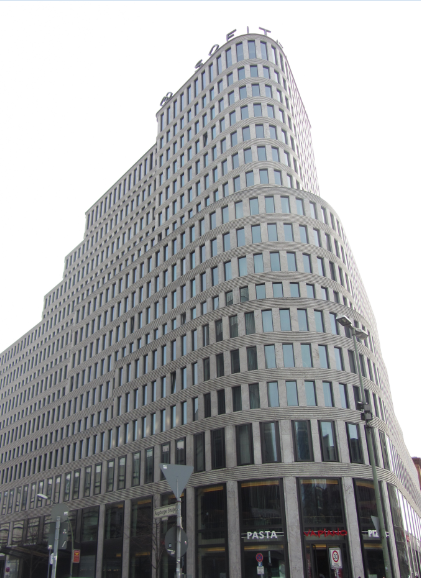 The Radisson Blu Berlin is a great hotel located in a very interesting area in Berlin! I did appreciate the modern look and recommend staying there! Rated as one of the top hotels in Dusseldorf, we knew that our stay at the Breidenbacher Hof (a Capella hotel) was going to be a great experience and it was … As soon as we arrived at the hotel, we were greeted by a very friendly, yet not too formal, bellman. He kindly asked my name and guided me to the reception. Check-in was very efficient and we did get some clear information about the hotel such as the free non alcoholic drinks during the day in the guests “dining room”, etc. Oh, I do need to mention this: no “staff” here, they call it “personal assistants”, very nice touch and very personal approach. We also received a map of the city and were surprised by how central this hotel is located. The upscale shops are just a few steps away and we walked to the old city center in about 10 minutes. 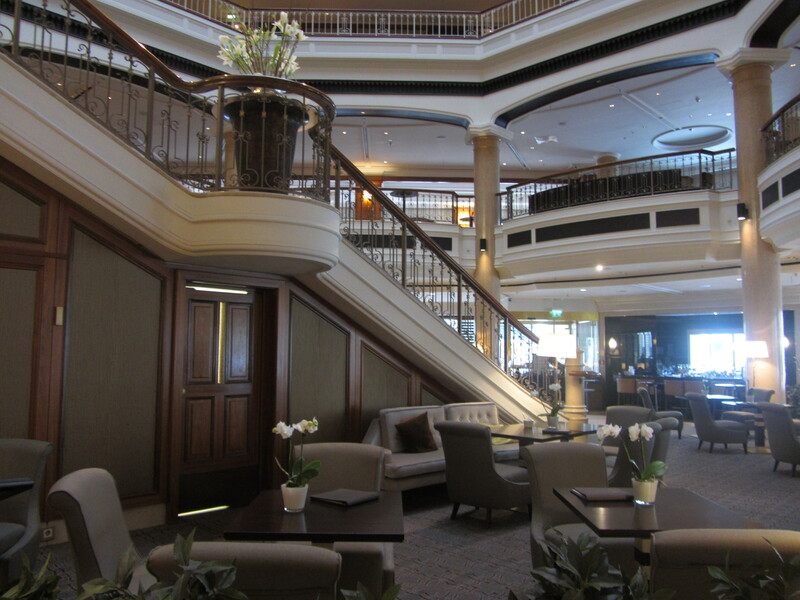 The lobby area is spectacular with a stunning staircase and cosy luxurious seating areas. 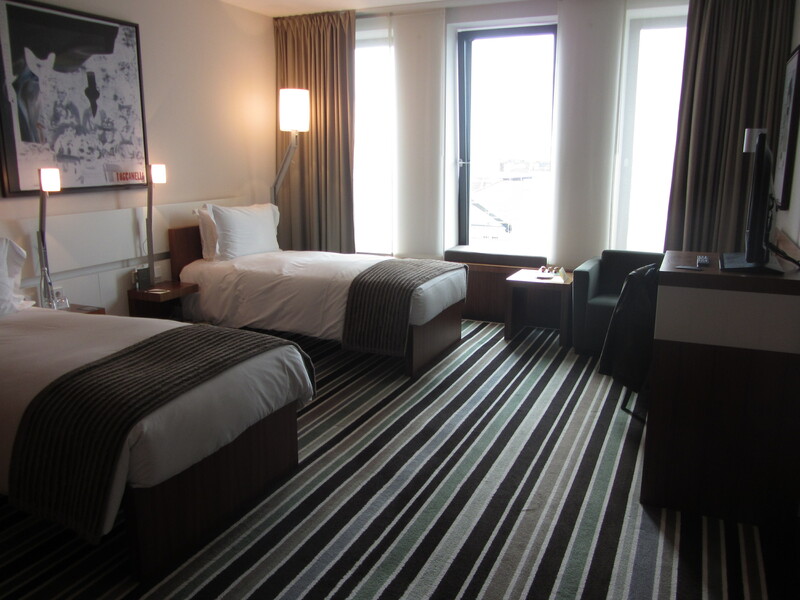 We stayed in a very spacious deluxe room and absolutely loved it! As you enter the room, you will notice the high quality decoration. 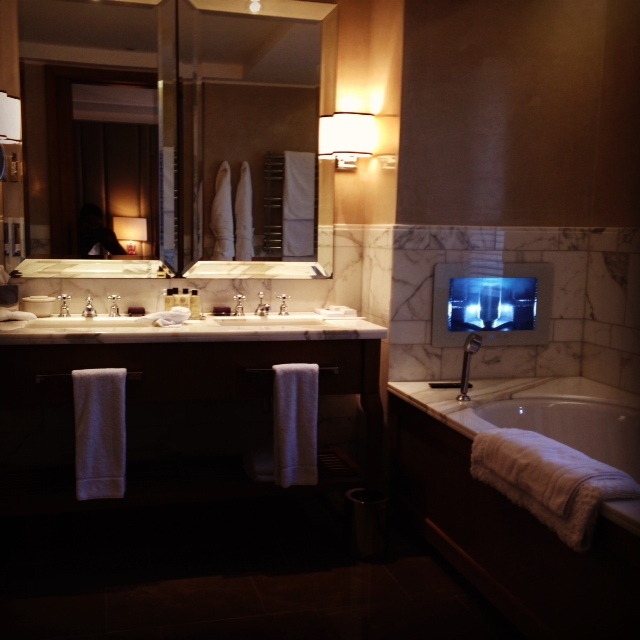 To be honest, it was one of the nicest 5 star hotel rooms I have ever seen. After a full day of shopping and sightseeing, there is no better place than relaxing in those cozy couches. The bedroom is very large and has very soft beds with plenty of pillows to choose from. 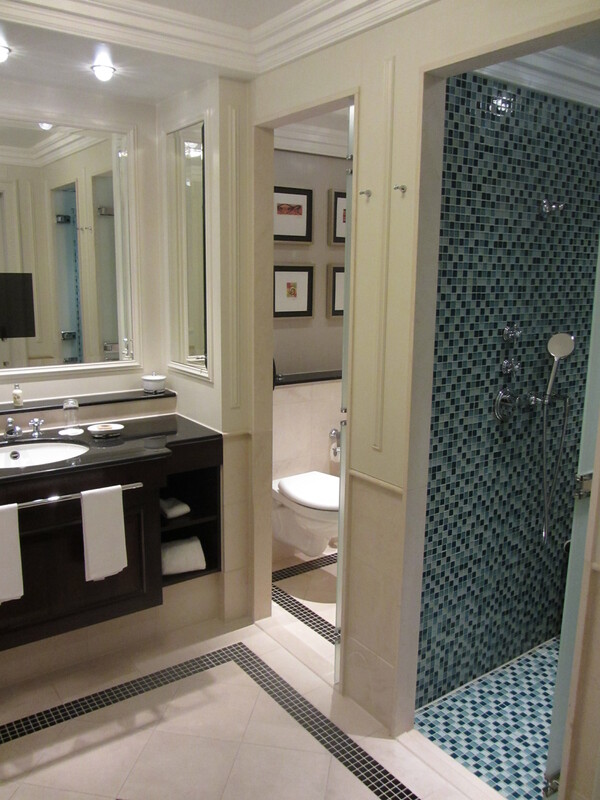 The bathroom has a bathtub and separate shower, single sink and a toilet. Bathrobes, an iPod-dock and espresso machine are there for your comfort. Even the minibar with soft drinks is included in the rate. There are touch panels from which you can control drapes, lighting, etc. 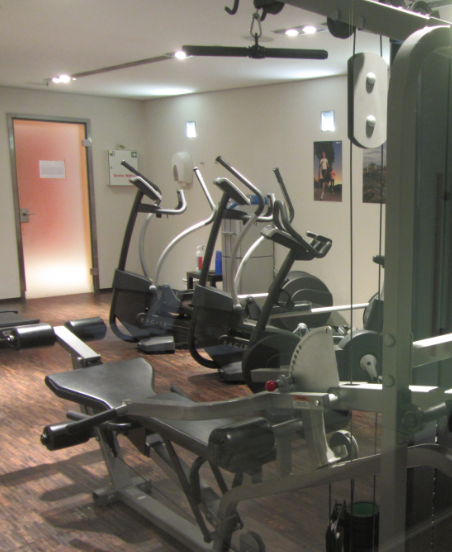 It would be very difficult to get bored at the Breidenbacher Hof as it offers a fully equipped hotel gym and a luxurious spa area. We tried everything: the indoor pool, traditional sauna and steam room. 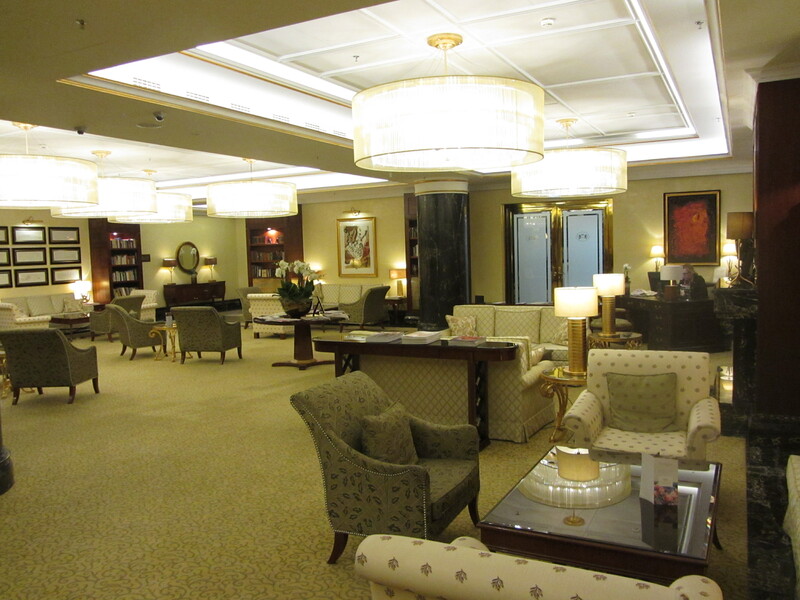 The place is very relaxing, beautifully decorated and impeccably clean. 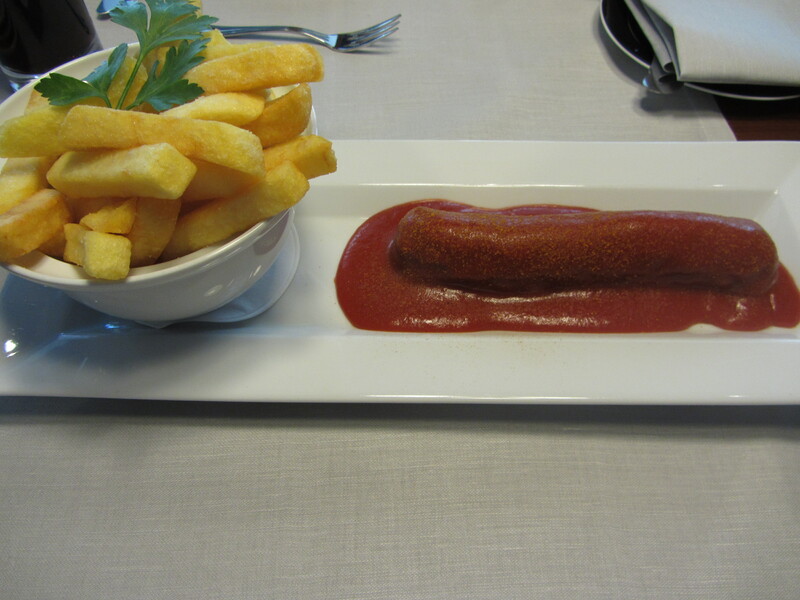 At night, we had diner at the Lobby Lounge and you should definitely try their traditional “Currywurst” J You’ll love it! 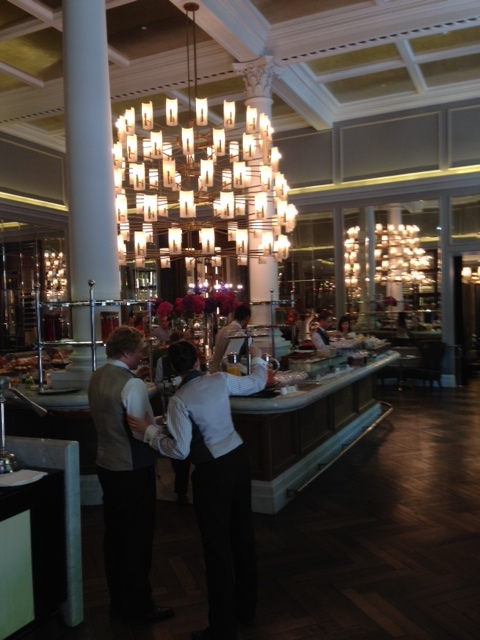 The next morning we were able to try out the other restaurant, the Brasserie 1806. Again, very classy! 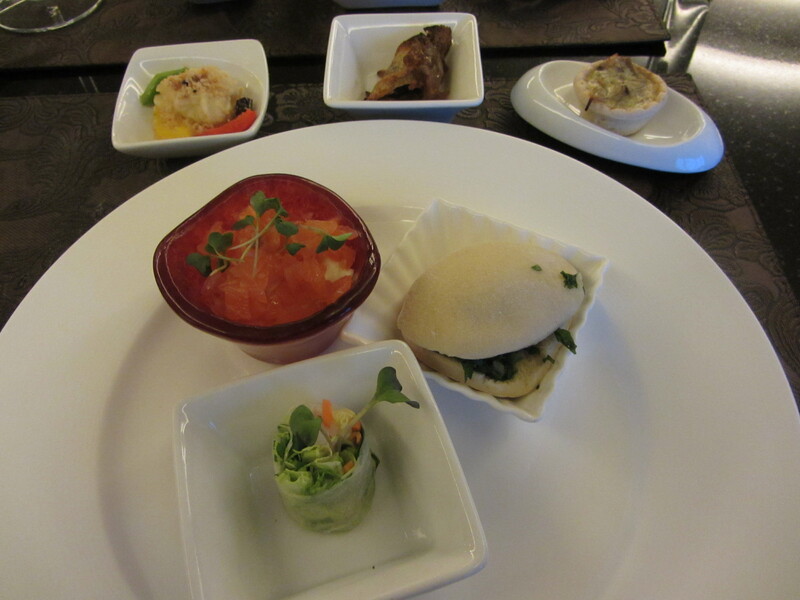 Breakfast was of a very high quality and offered a good variety of hot and cold items. There were several options: buffet, à la carte or both. We tried both and did not regret it. 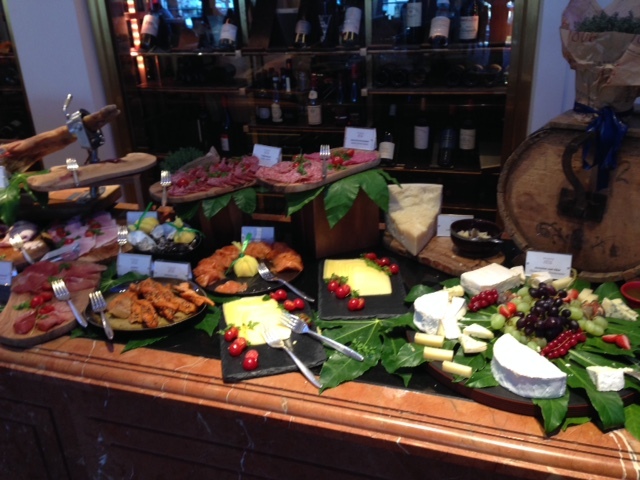 From the delicious latte macchiato to the freshly made apple pie… Once again, one of the best buffets I have ever seen! I loved every single bite and sip. 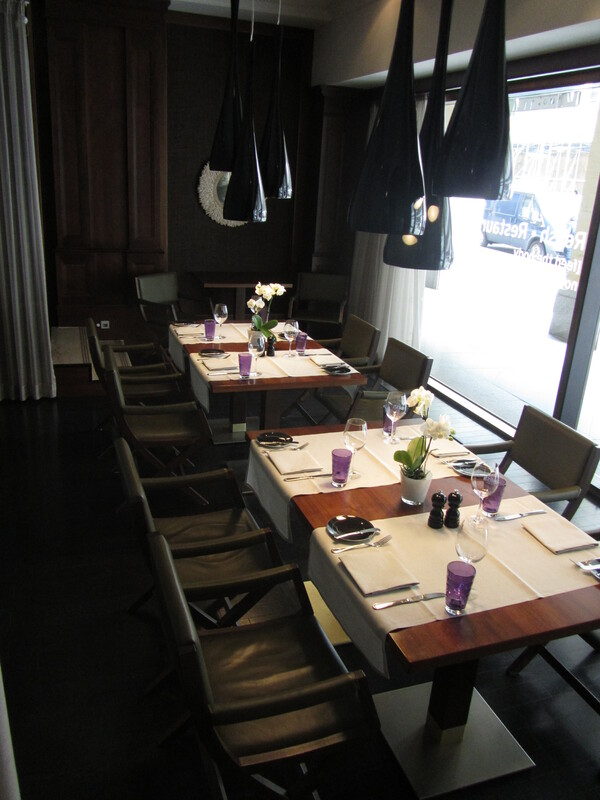 If you are looking for an upscale hotel in a great spot, do not hesitate to stay at the Breidenbacher Hof. 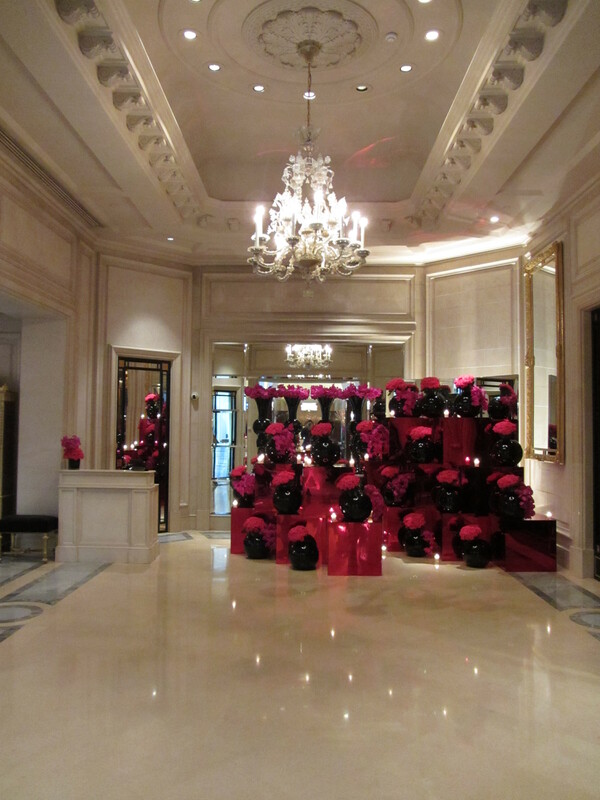 It is a true 5 star hotel where you will be treated as a star!